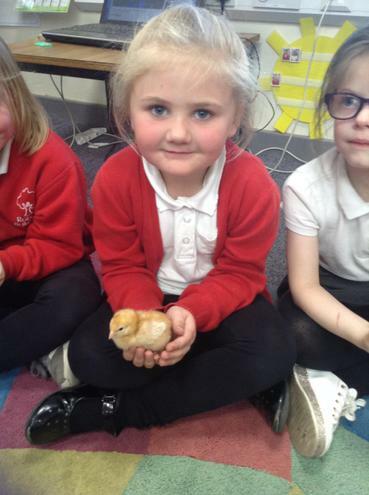 The children are being very responsible and taking good care of our new friends. 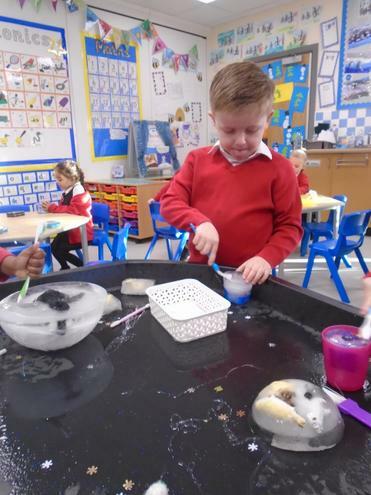 The tadpoles and chicks are growing well. 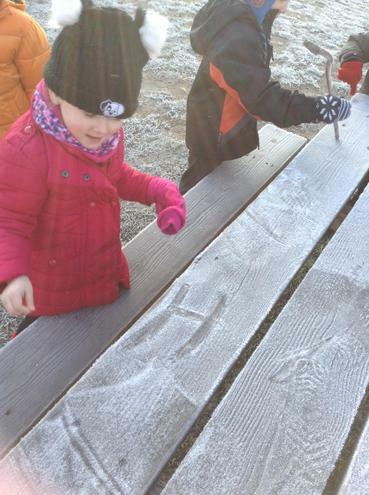 Please come and visit them anytime. 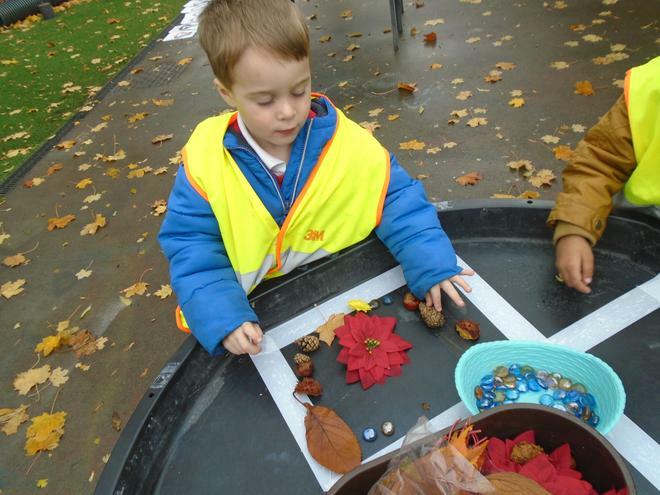 Ask your child to tell you of the changes they have observed. 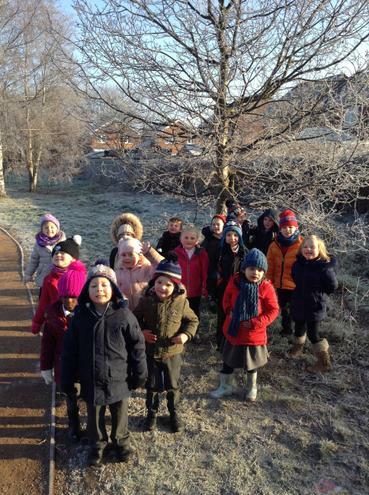 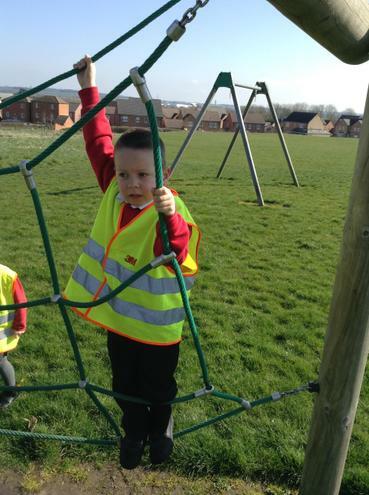 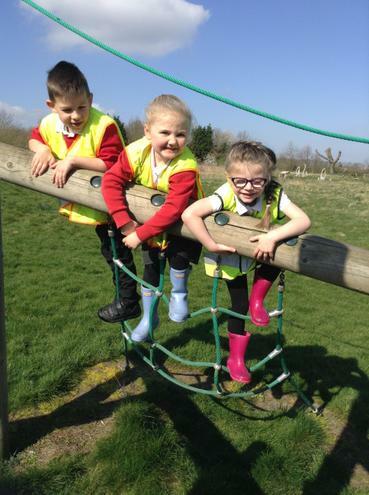 The children enjoyed their brisk walk in the glorious sunshine. 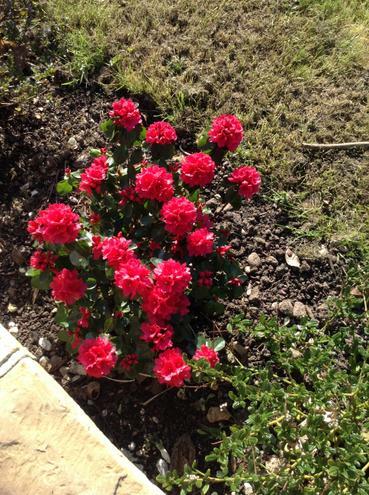 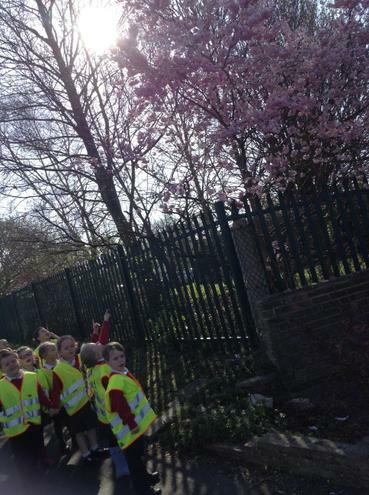 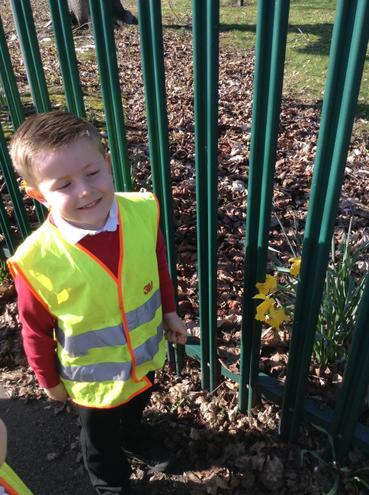 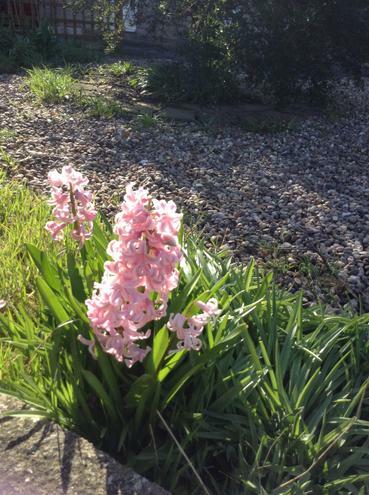 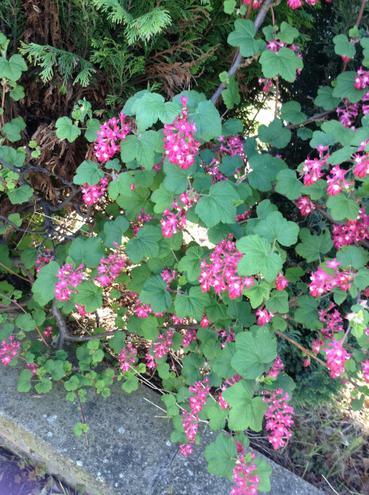 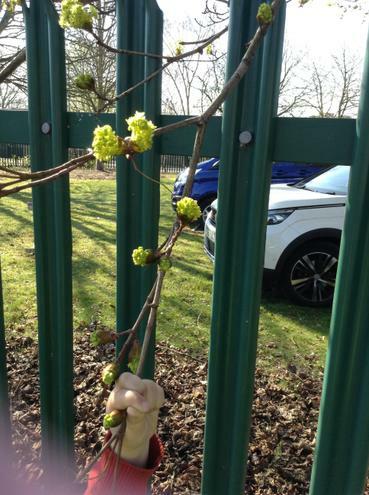 The children were on a mission to find signs of spring. 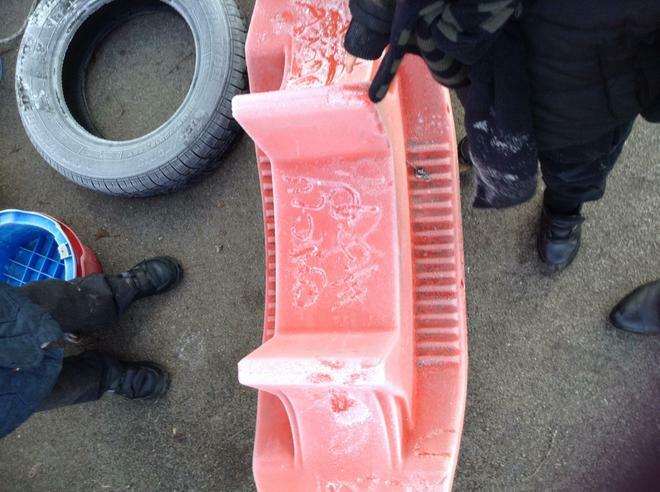 Here is what they found. 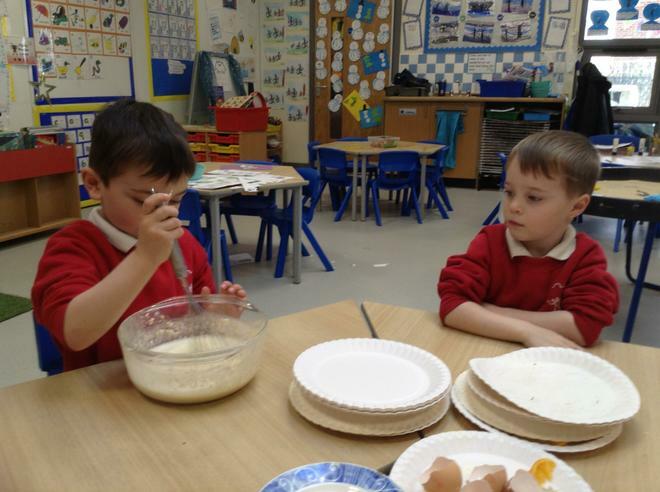 We have had a delivery in REA of some eggs. 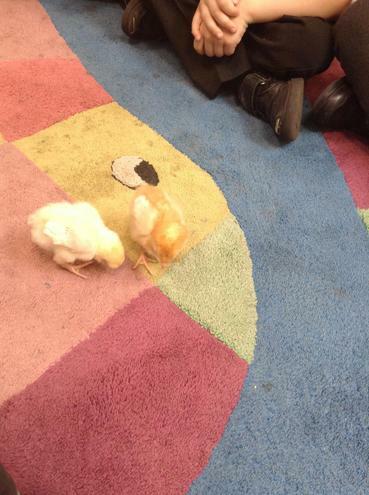 What do you think will hatch out? 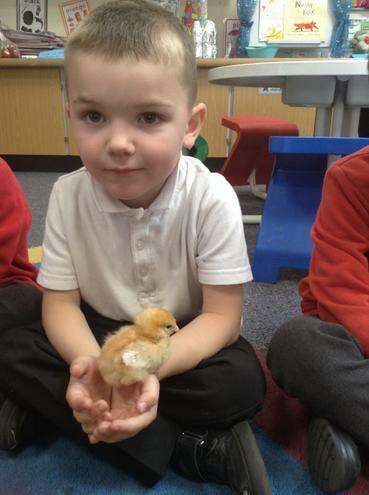 Yes, there are tiny chicks inside the eggs. 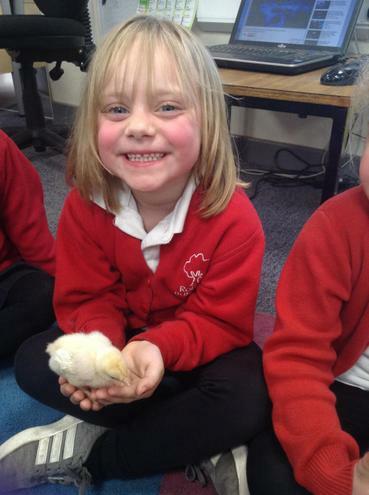 Currently 8 out of the 10 chicks have hatched. 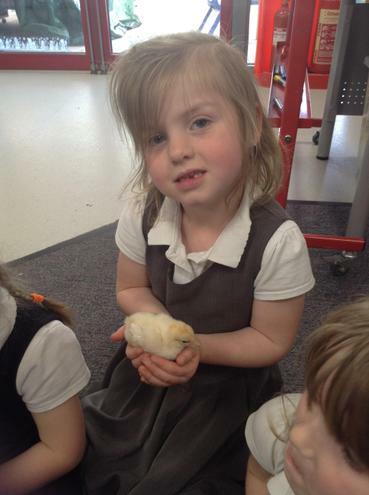 We cannot wait to help feed and look after our fluffy new friends. 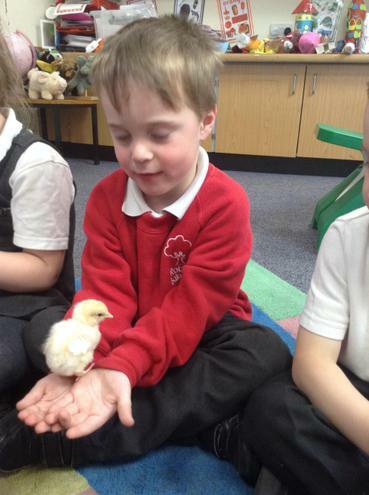 Did you know that girl chicks are yellow and boy chicks are white? 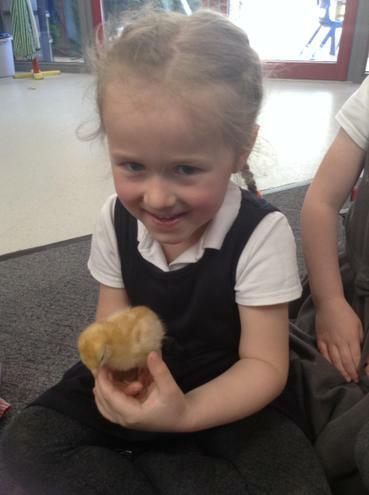 Please feel free to come and see the chicks and tadpoles. 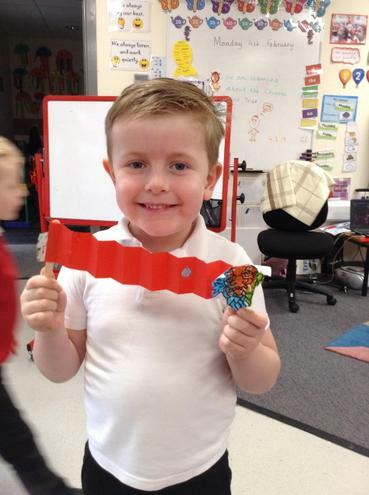 The children have been learning about the life cycles of butterlies and frogs. 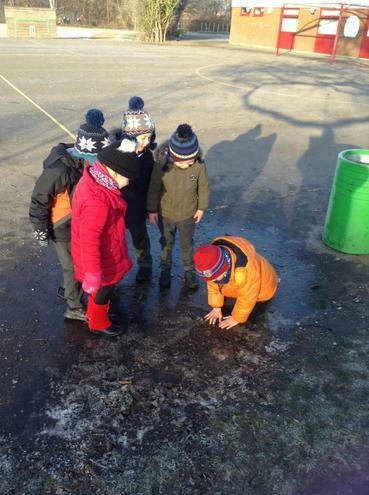 The children are very fortunate to observe at first hand how frogspawn turn into frogs. 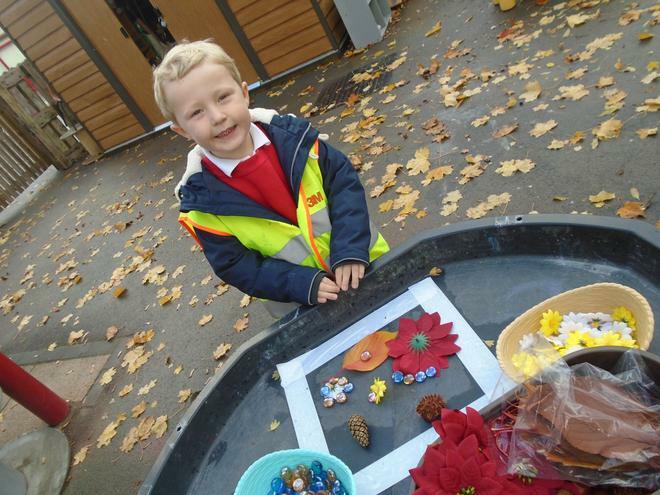 Please ask your child to explain the cycle to you. 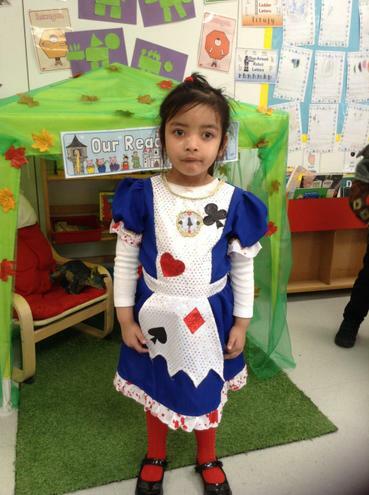 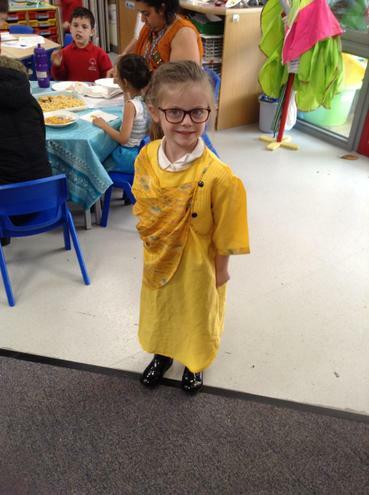 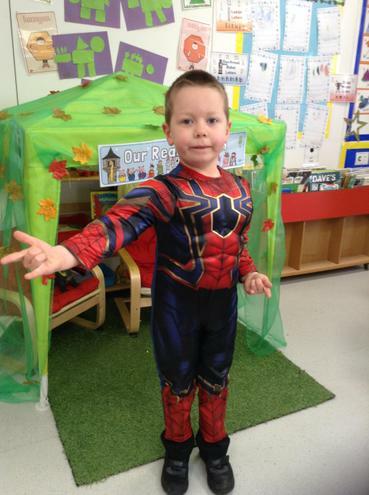 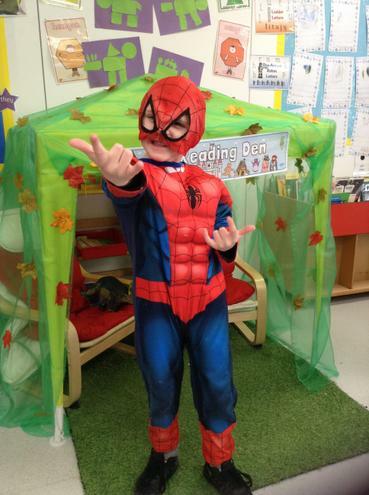 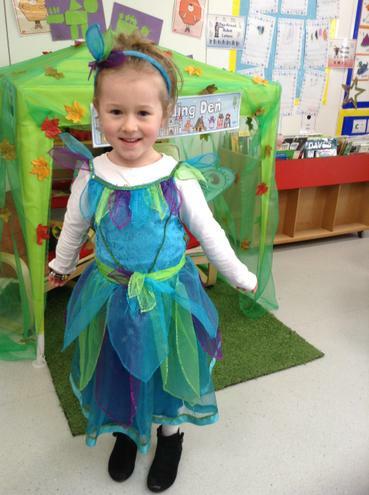 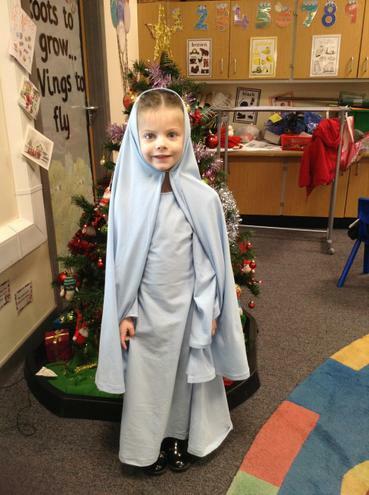 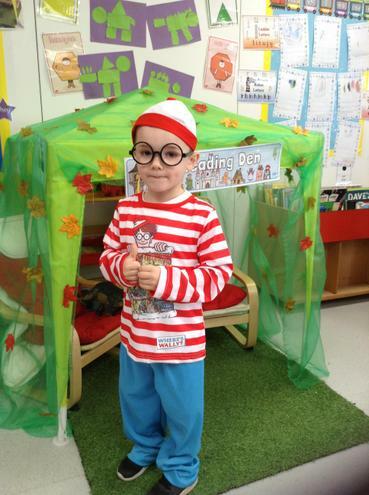 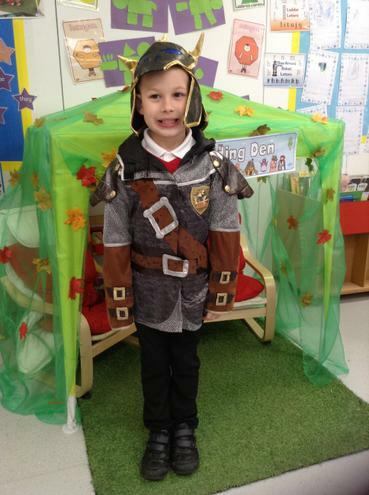 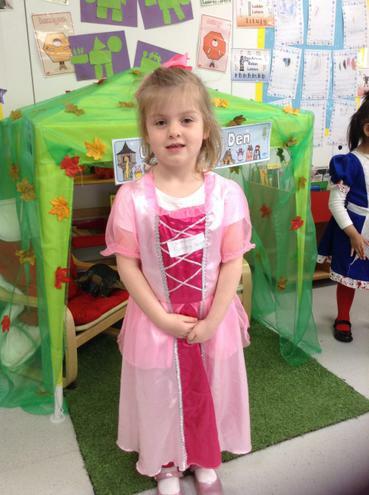 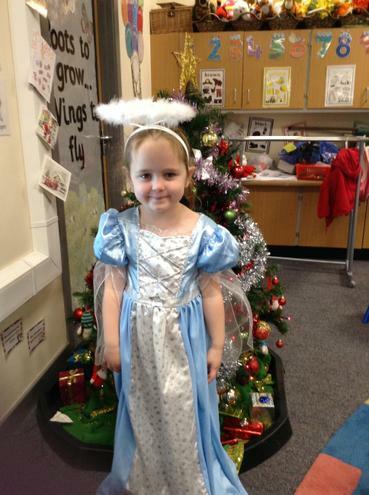 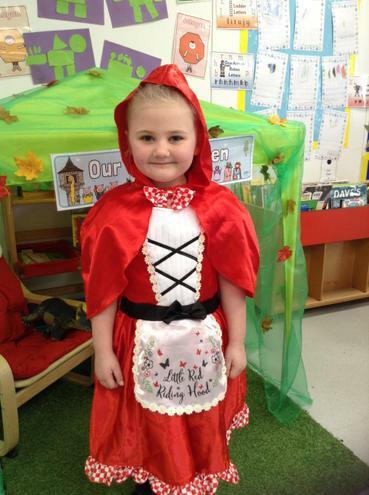 The children looked amazing today in their costumes for World Book Day. 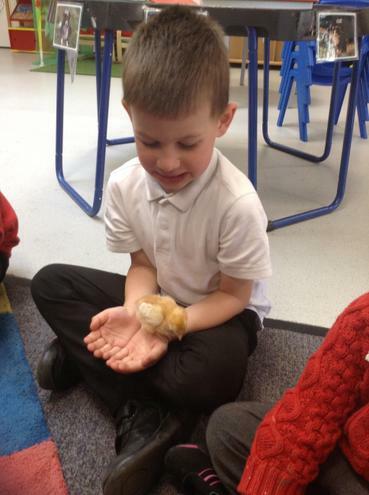 They were really keen to share thier favourite books and have enjoyed listening to other adults come and share stories with them. 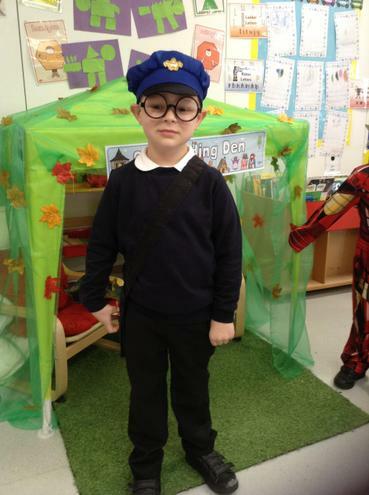 In the afternoon we also had a visit from class 3D who read stories to us. 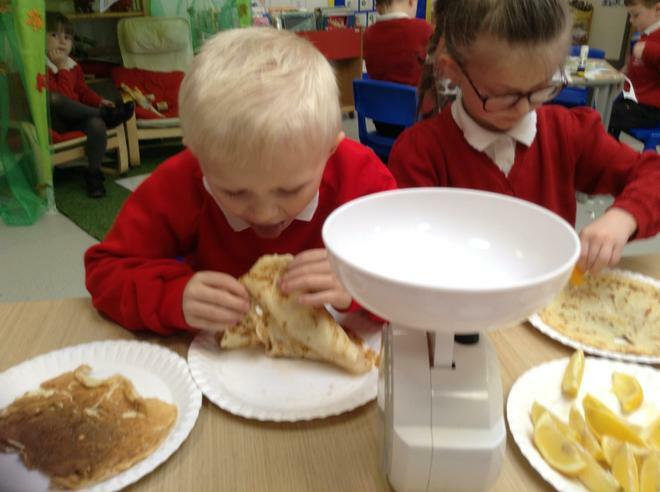 The children have learnt about why pancakes are made today and the significance of it to Christians to mark the beginning of Lent. 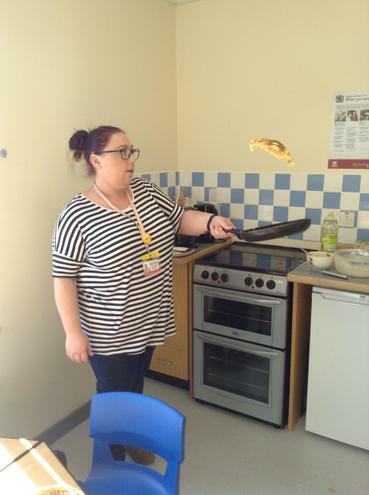 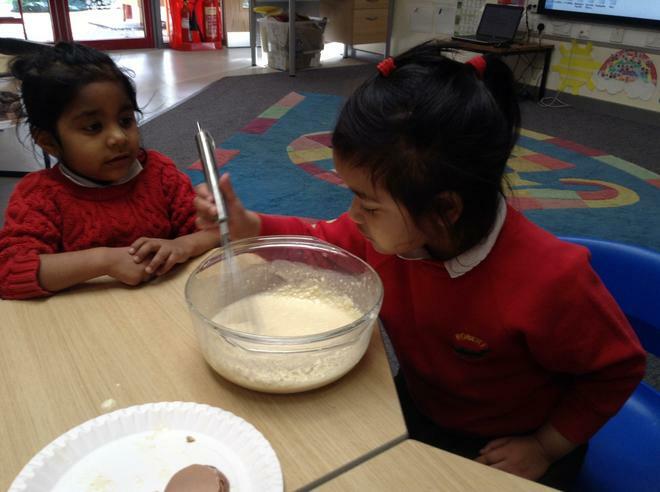 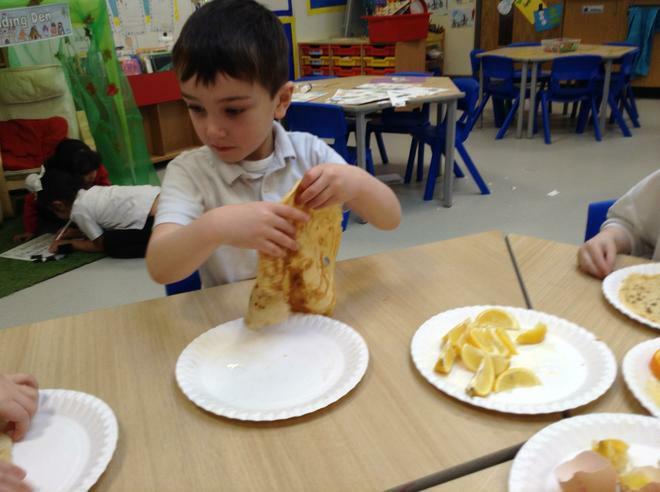 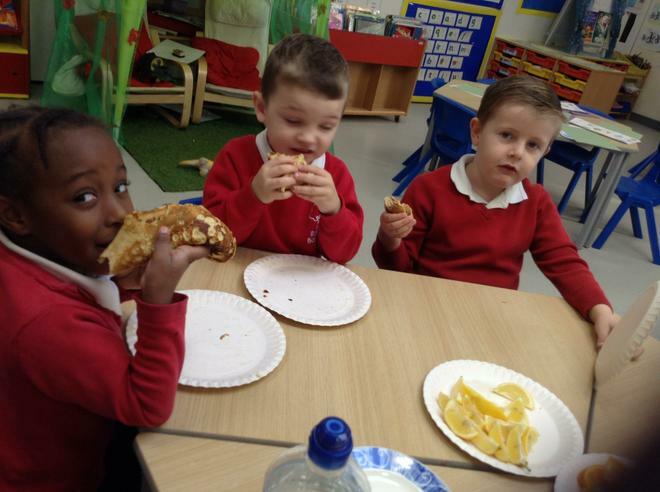 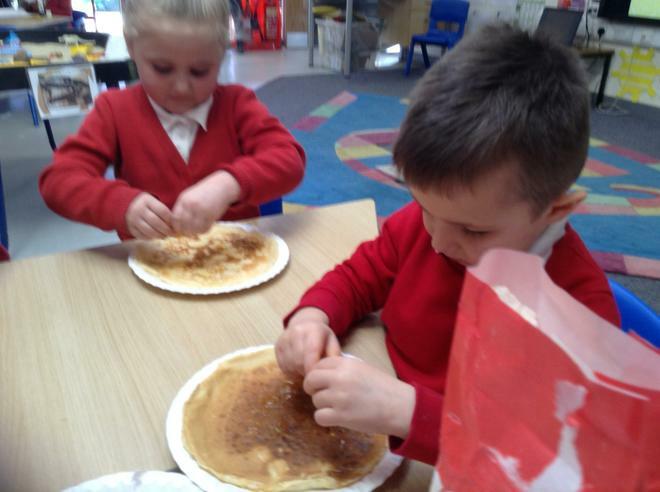 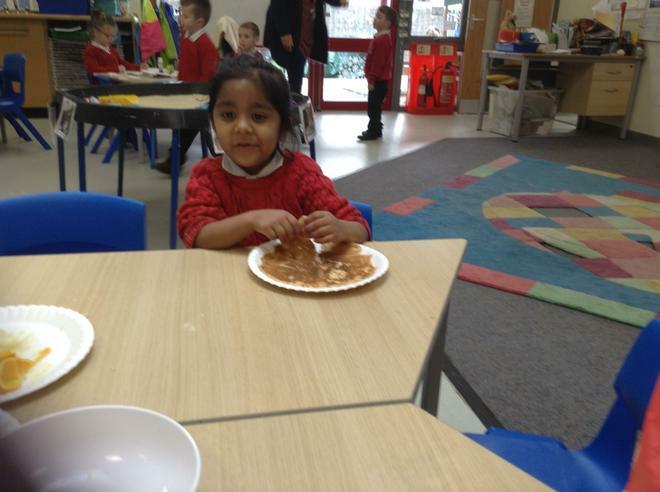 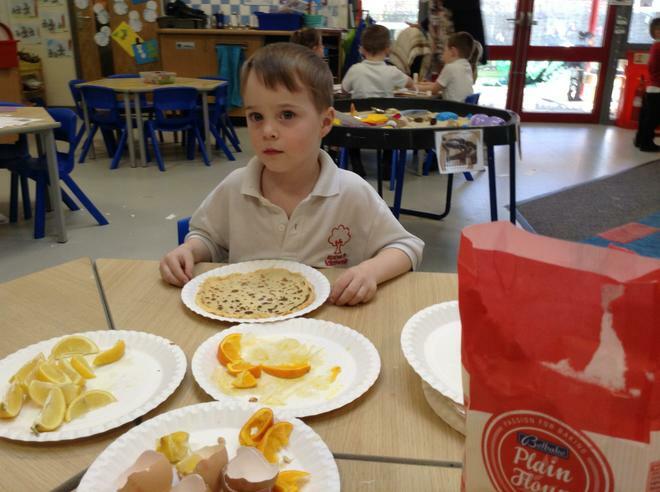 The children have enjoyed making pancakes with Miss Allan and talked about their favourite toppings. 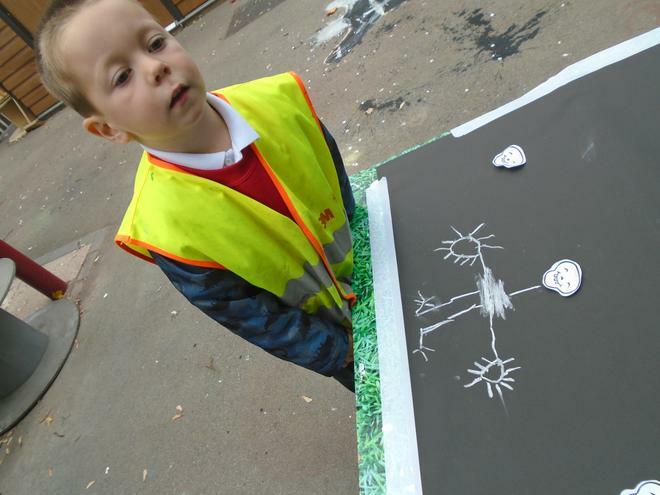 The children were excited as Mummy dinosaur had been back and this time she had left an egg. 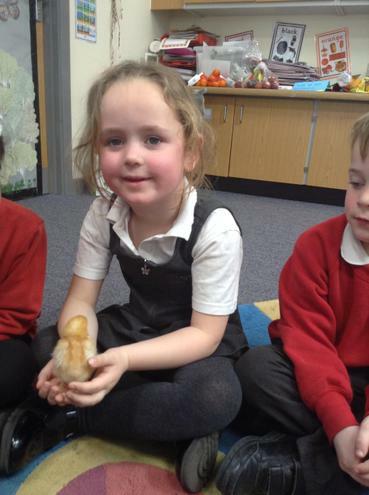 The children have decided to look after it until she returns. 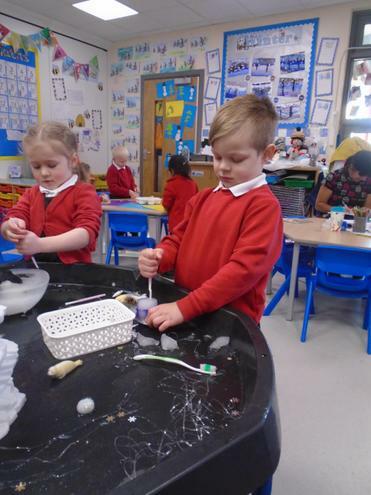 The children discussed what we needed to do. 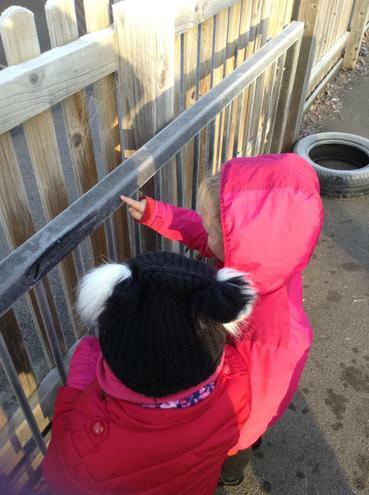 Toby suggested we put a warm blanket around it and Mila said we needed to be quiet when exploring outside. 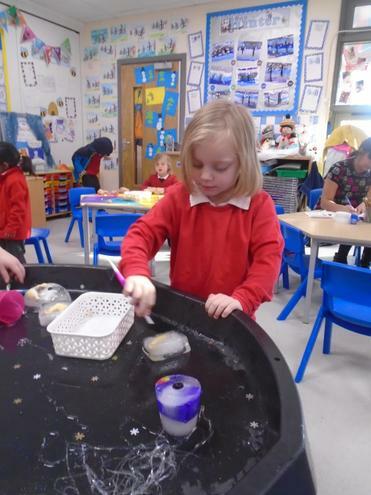 The children are getting really excited as each day they discover something new. 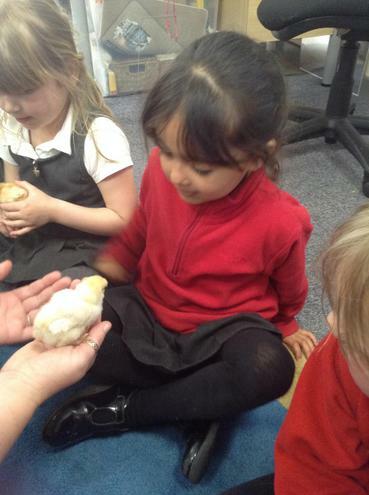 Some have heard tiny screeching sounds whilst others have seen small cracks in the egg. 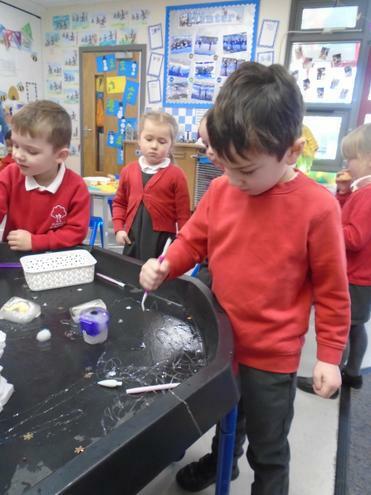 We hope Mummy dinosaur gets back before the egg hatches. 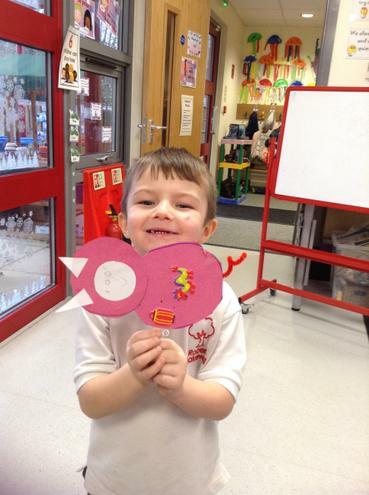 We also received a letter from Andy who informed us that a dinosaur had in fact come through the time machine. 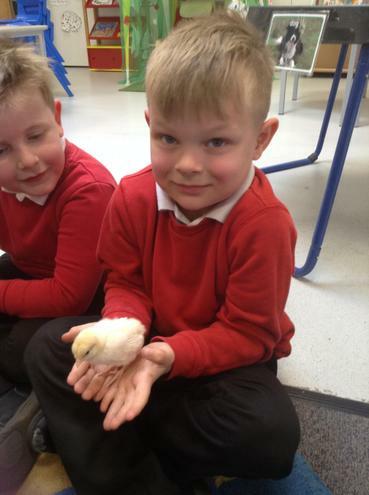 He told us not to worry as he believes it is a plant eater. 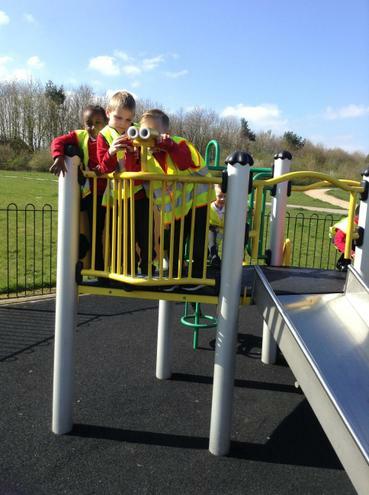 He has asked us to keep a look out for the dinosaur and report back any findings. 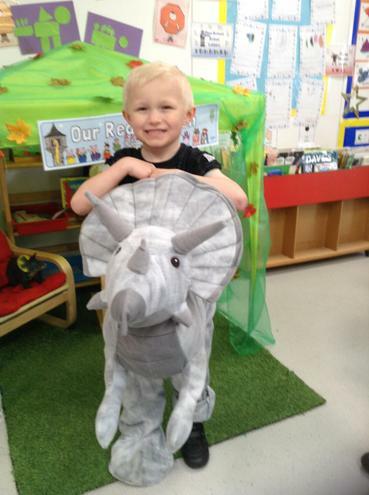 We are learning facts about dinosaurs so that we can help locate the dinosaur and send it back. 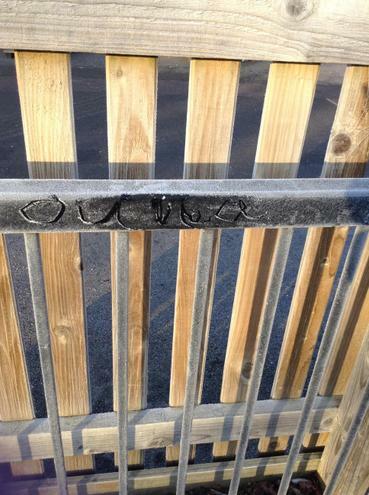 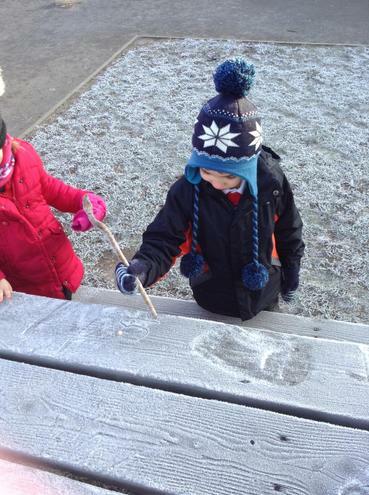 The children came back after half term to discover some footprints leading to the classroom from outside the gates! 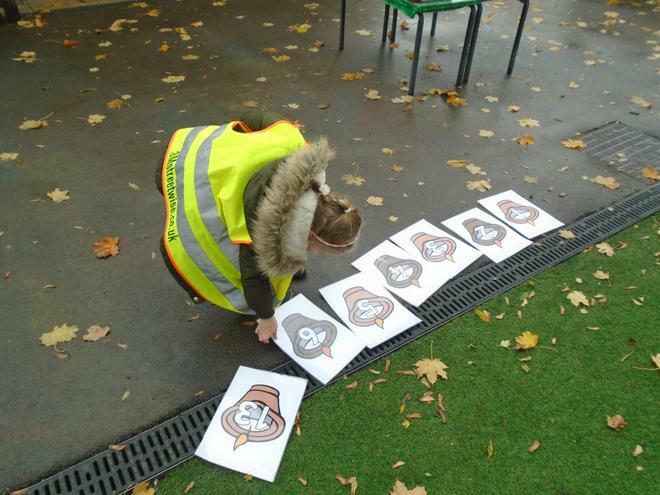 The children had a lot of ideas on what had made these prints. 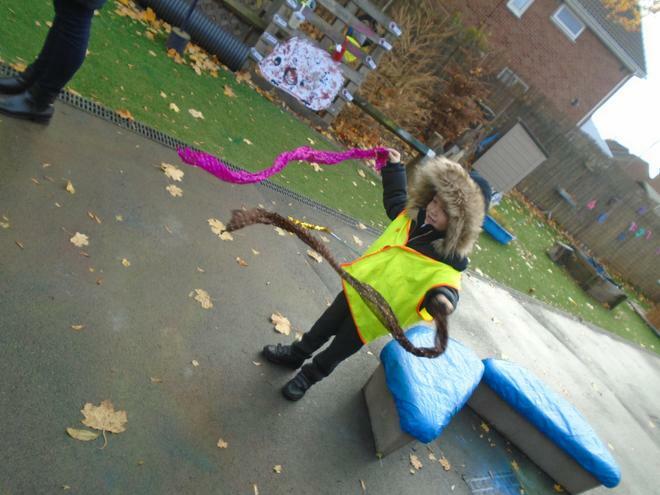 These ranged from bears, giants, monters to aliens and dinosaurs! 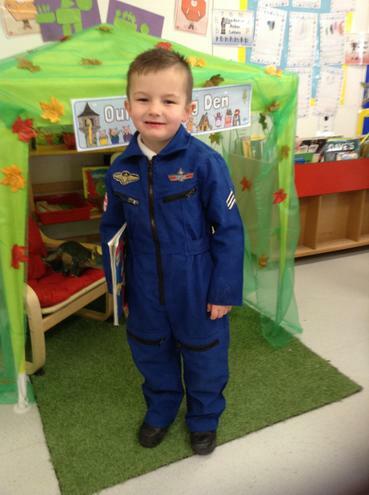 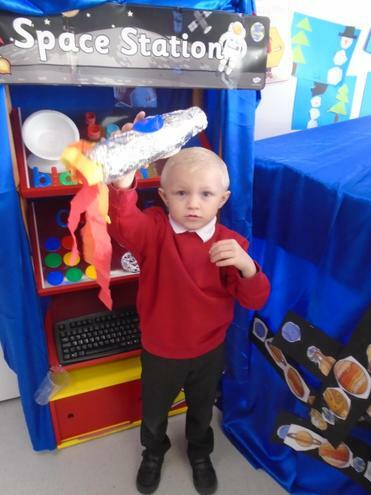 The children arrived to school on Monday morning to find that a space craft had crash landed on our classroom roof! 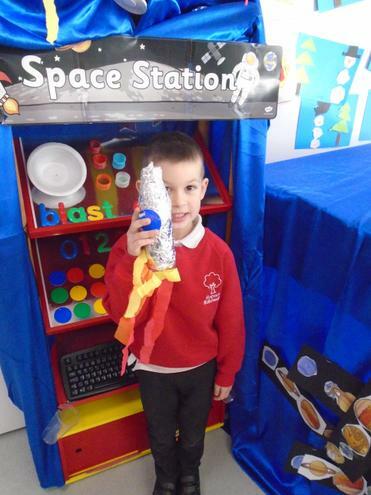 Not to panic as Mr Bishop rang the space centre in Leicester who informed him that they were aware of the landing and that it was perfectly safe for us to remain in the classroom as the aliens were friendly. 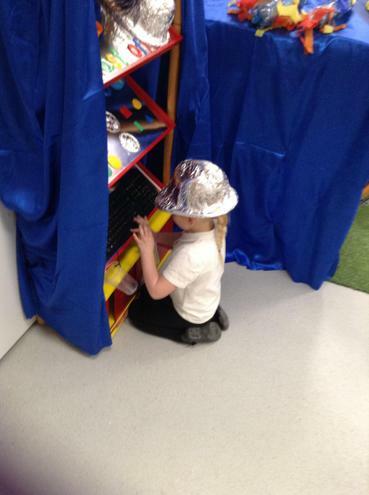 They were going to send the experts in later that day to investigate. 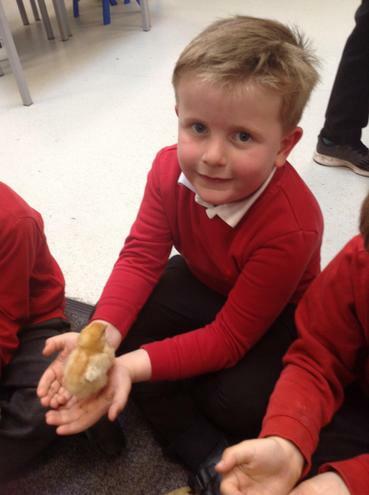 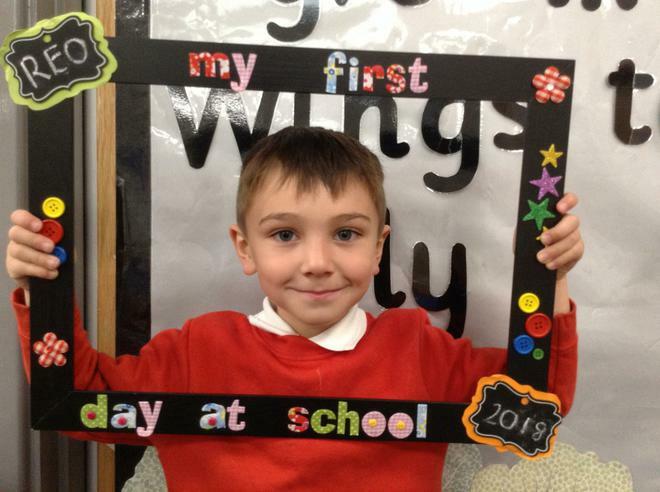 I am really proud of the way the children continued with their learning despite beady eyes watching them from above! 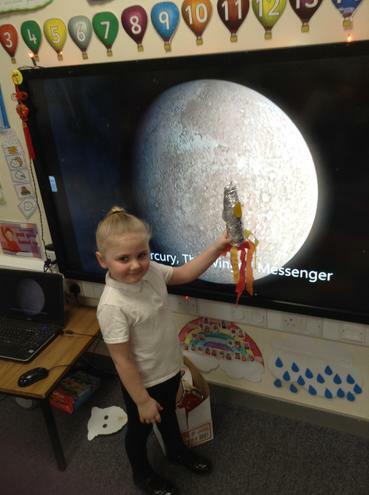 The children have enjoyed observing our friends from outer space and have been making new friends for them. 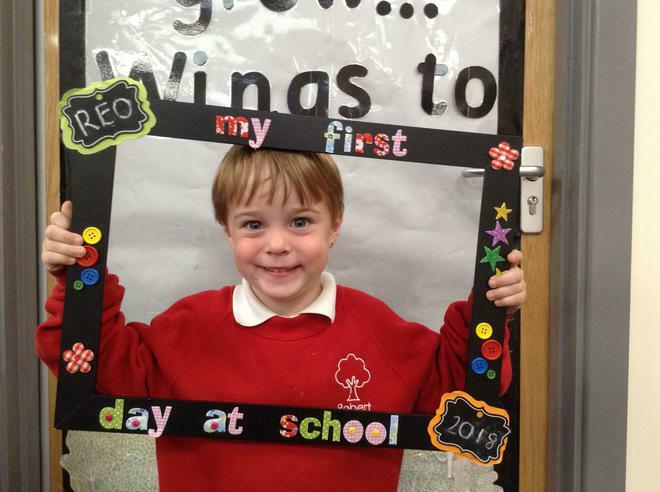 The children used the class camera to take their own photographs. 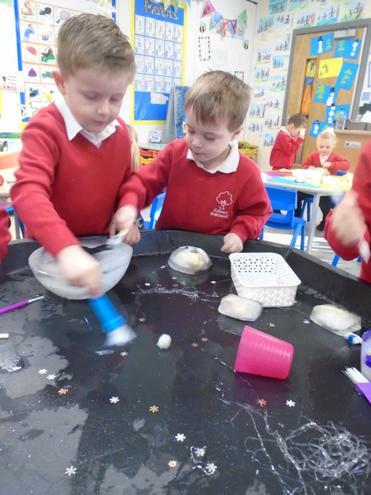 The children have enjoyed finding out facts about what lies beyond our planet Earth. 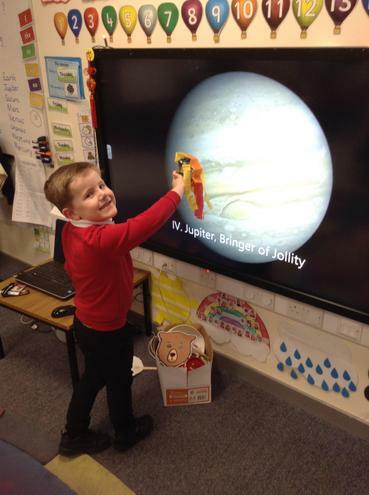 They have learnt the names of planets and simple facts about them and have also enjoyed learning about the history of space travel. 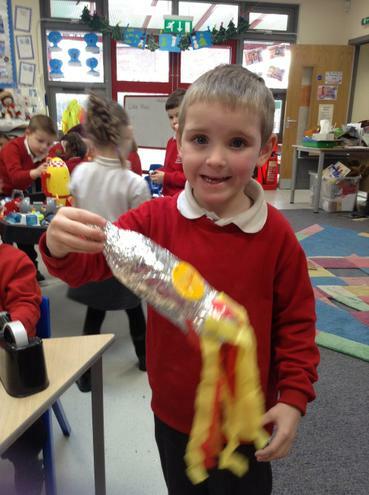 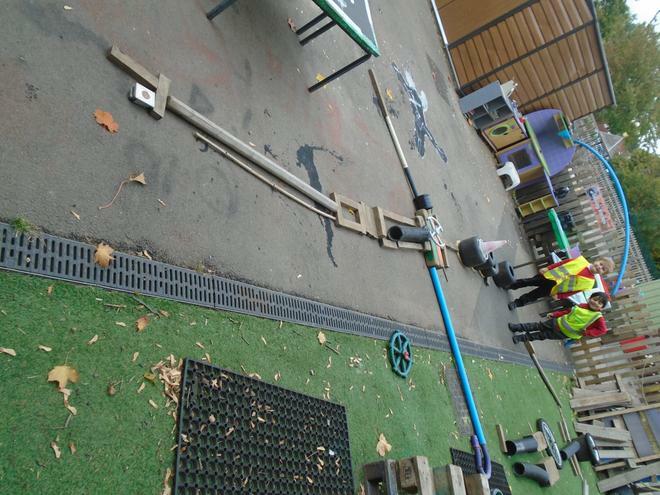 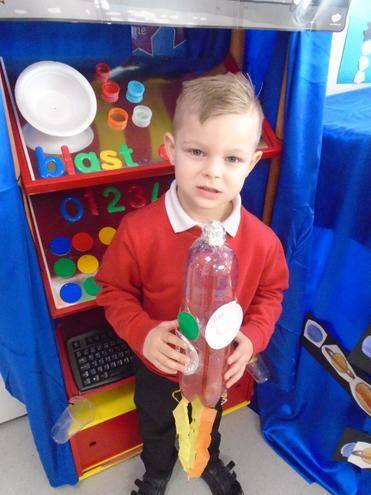 We have looked at rockets and children enjoyed making their own from reclaimed materials. 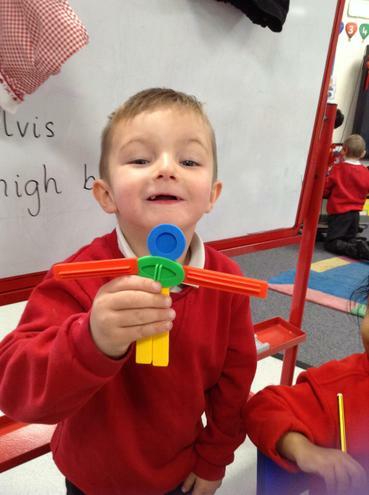 The children are having great fun learning early programing skills. 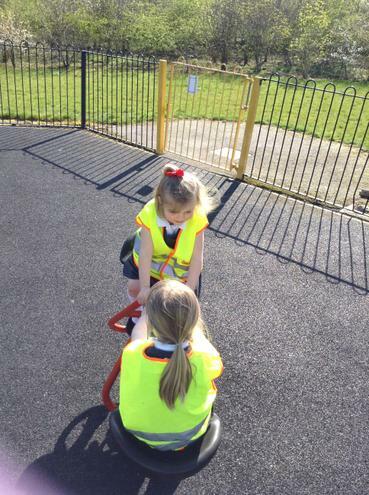 The children are becoming familiar with giving the beebots commands to make them move to new spaces. 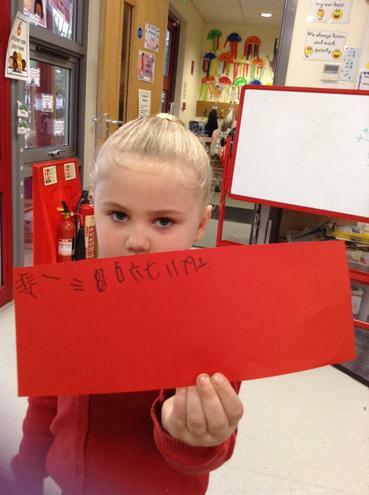 The children have had great fun celebrating the year of The Pig with REA. 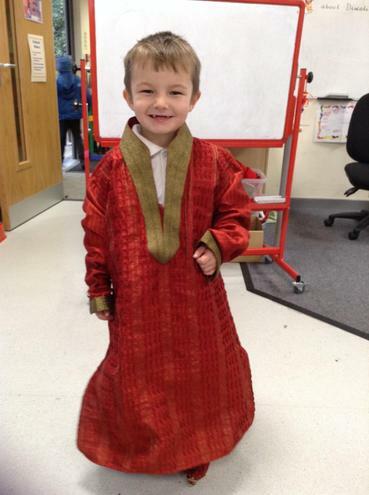 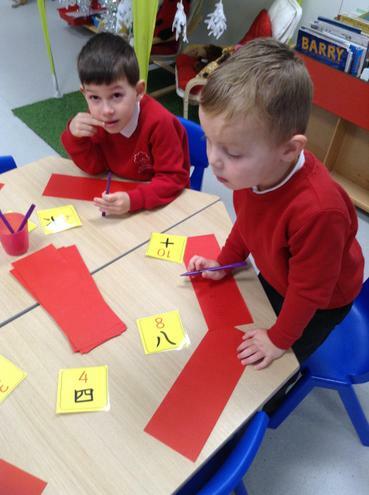 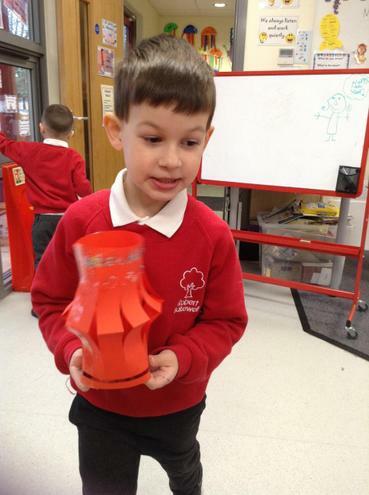 The children were free to explore a range of activities in both classrooms and have learnt about some of the traditions associated to celebrating the Chinese New Year. 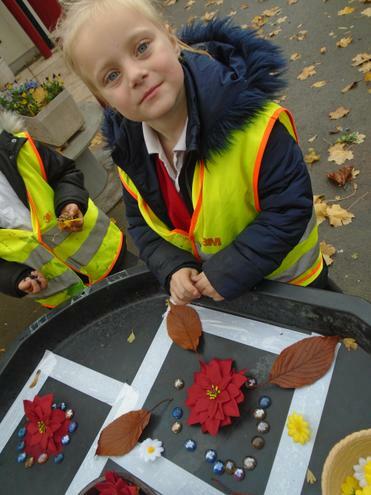 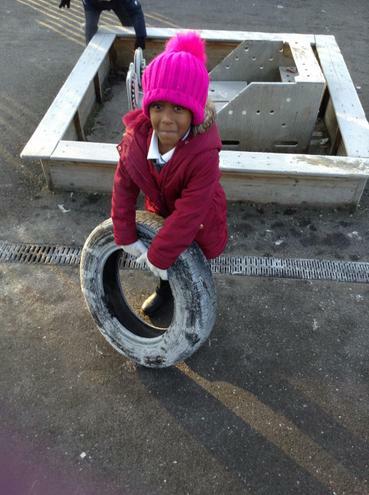 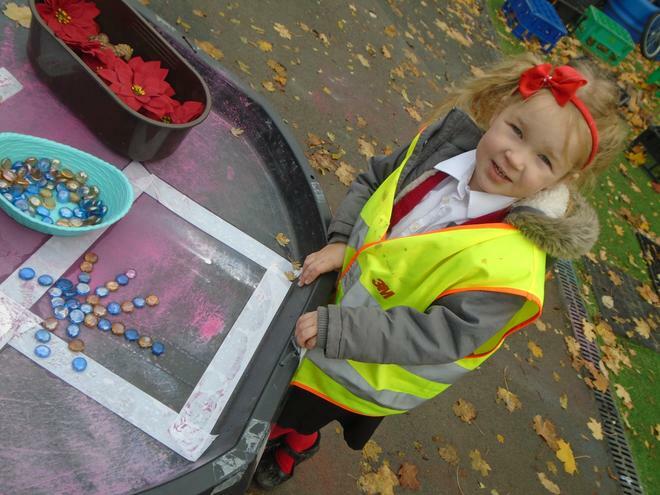 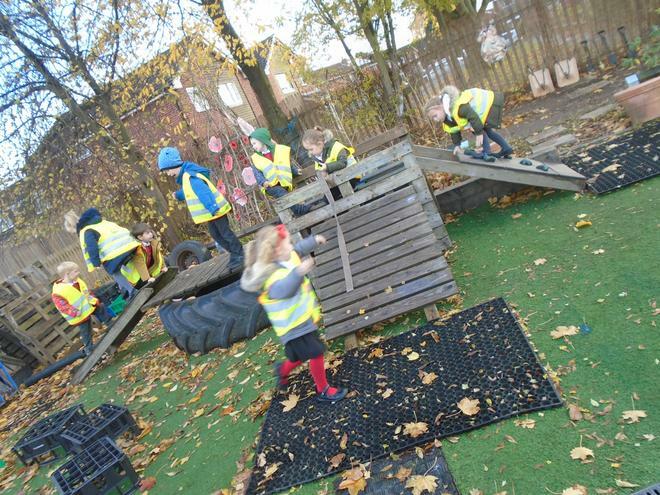 One of the best parts of being in the EYFS is the ability to take our learning outside. 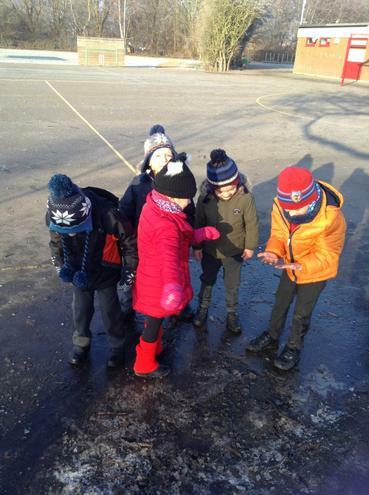 We are such eager learners that we would never let anything stop us, not even the weather! 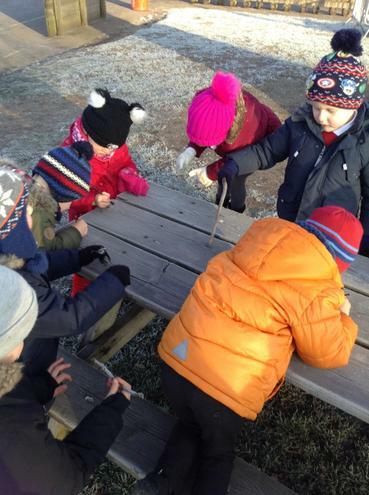 So on a very cold, frosty morning, we put on our warm layers and went outside to explore the wondeful world we live in. 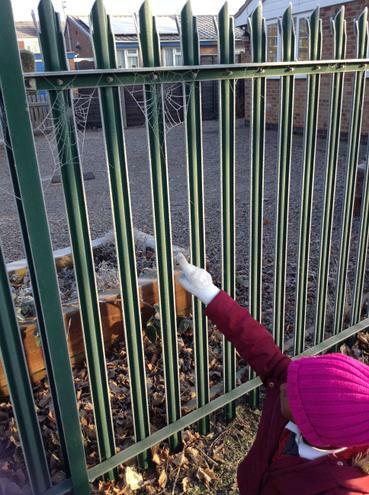 Look at what we discovered. 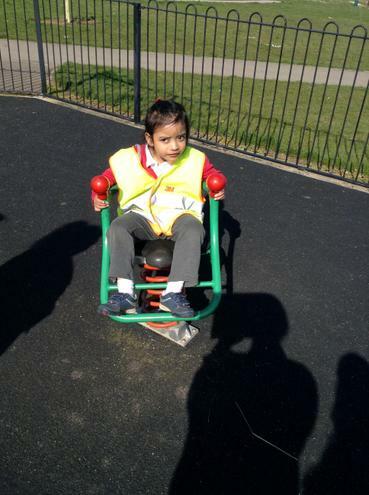 We have been exploring different modes of transport that allows us to travel around the world. 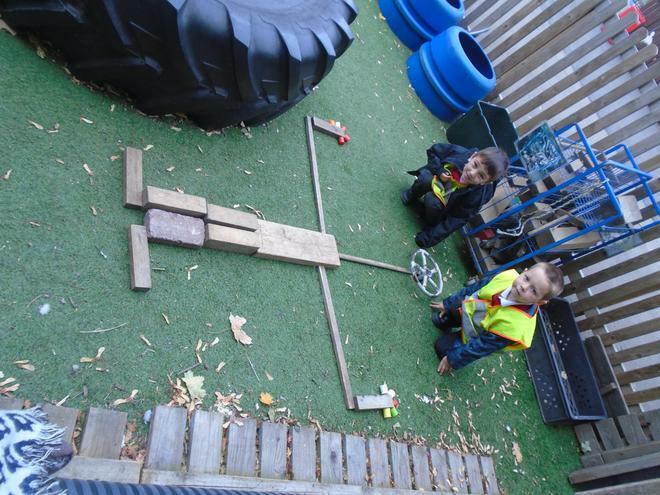 Children have shared their expereinces of travel and had great fun making models of vehicles from reclaimed materials. 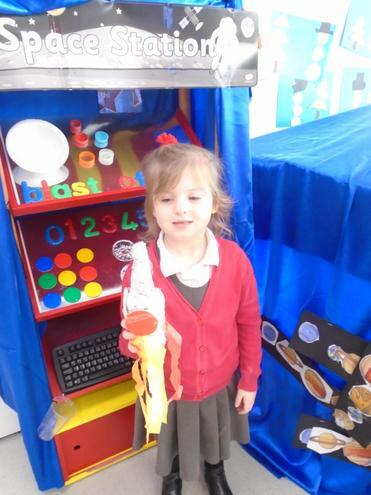 The children have had great fun with this much loved children's story. 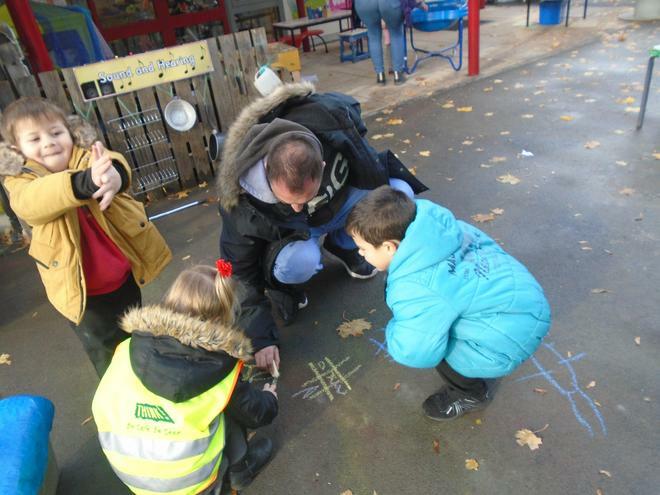 They have enjoyed re telling the story with actions as they follow their storymaps and are using good rhythm and pace. 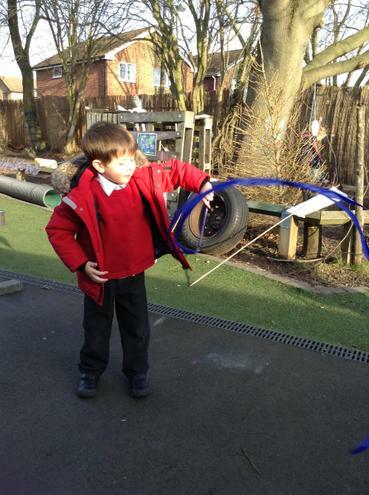 Some children have begun to use the structure of the story to help them create their own version. 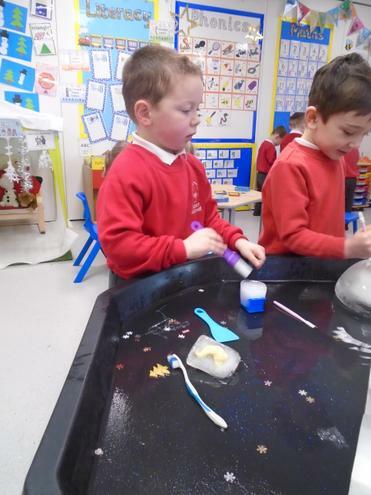 We have been on unicorn, mermaid and crocodile hunts too. 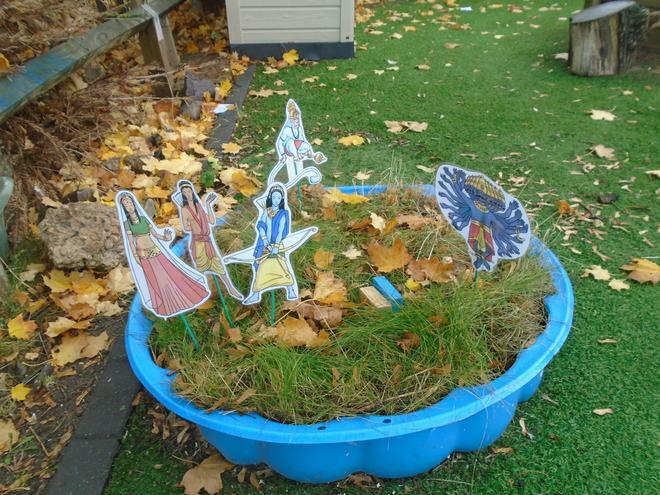 In the outdoor classroom the children have walked through a 3D depiction of the story and are using phrases from the story well. 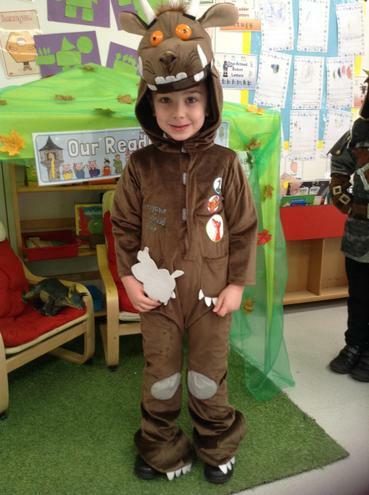 We're looking for the bear. 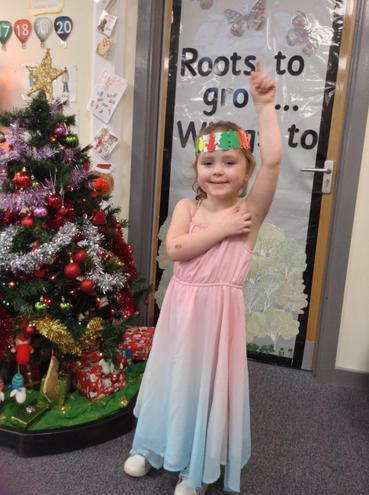 We hope you had an enjoyable break and are ready to embrace 2019 with gusto! 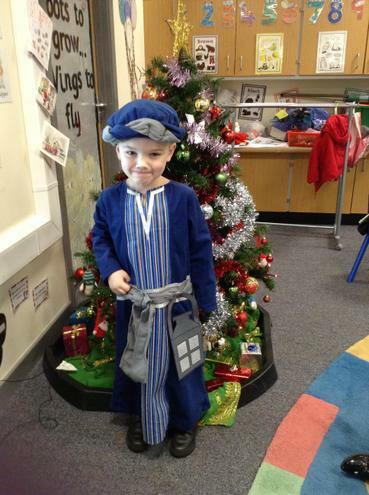 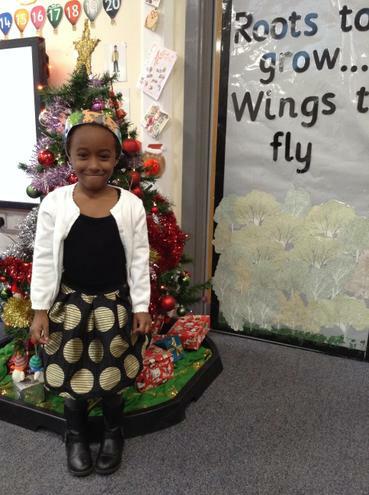 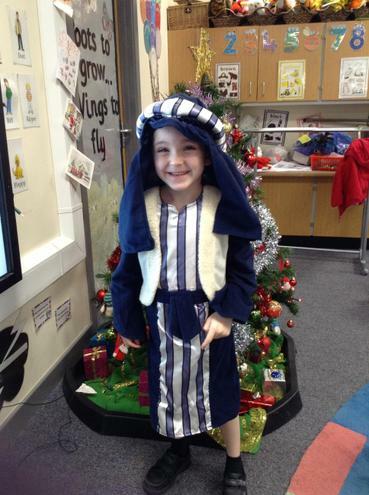 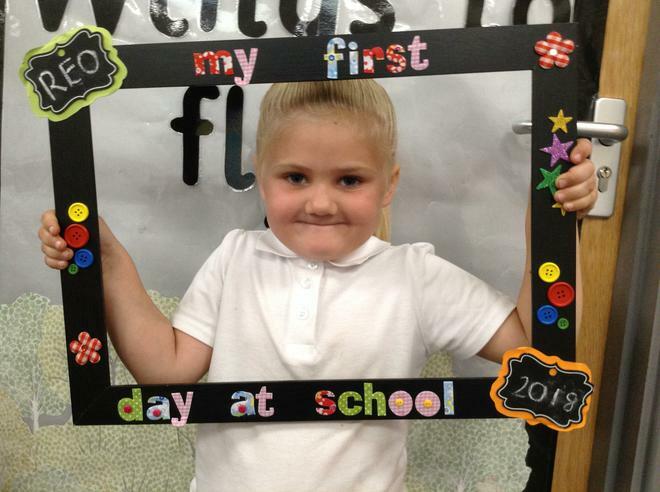 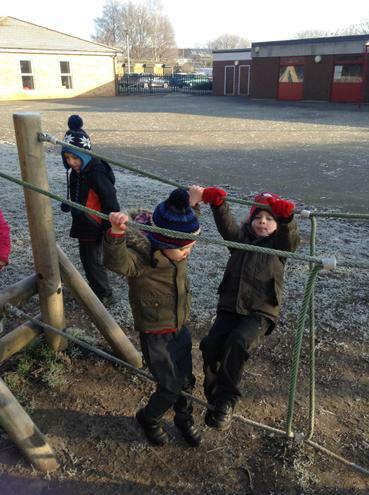 The children have returned ready to embrace more as they continue with their learning journey. 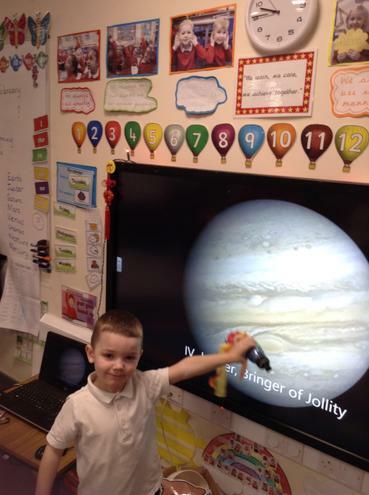 Our new question this term is 'Where are we going?' 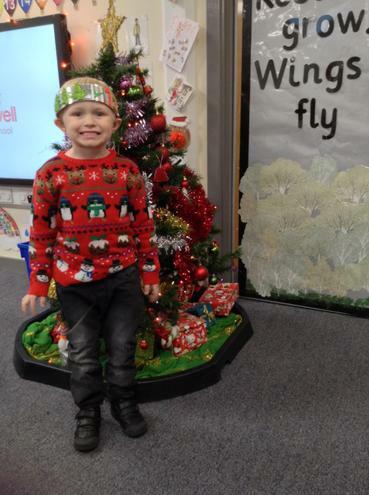 Please read the topic map below to see what we will be covering and how you can help. 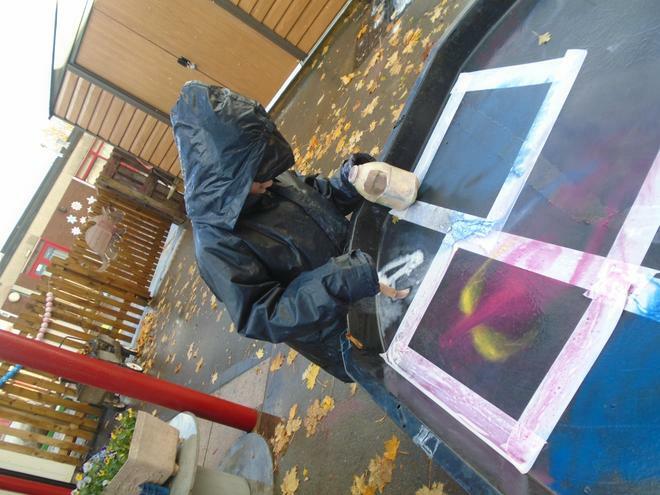 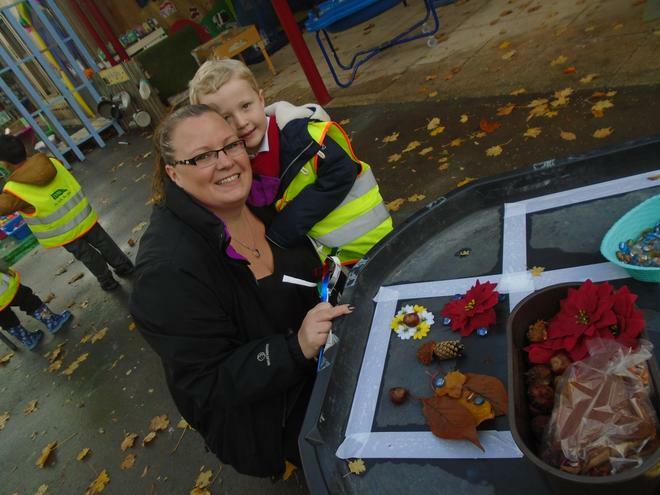 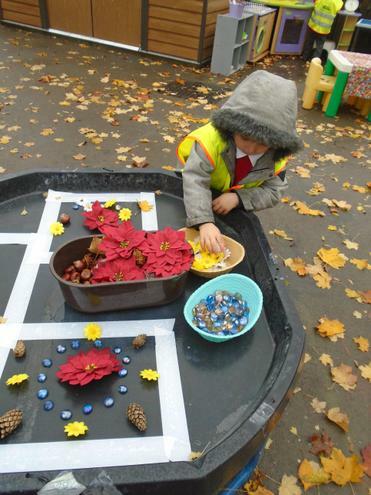 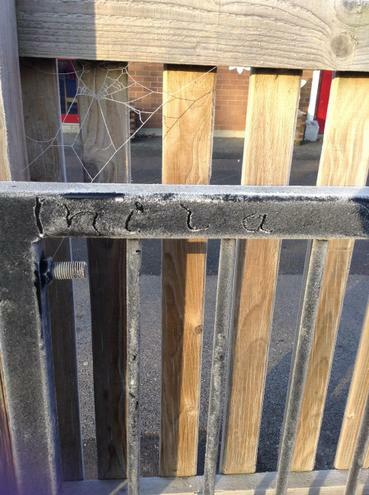 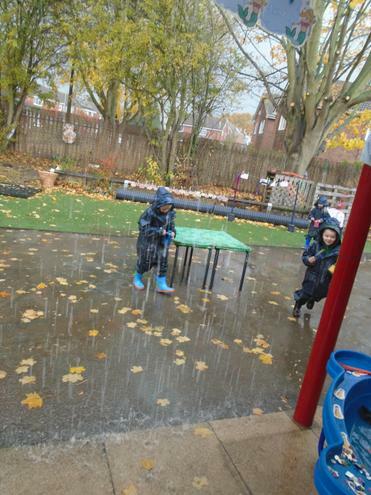 The children have been exploring the changes in the outdoor area as the weather has become colder. 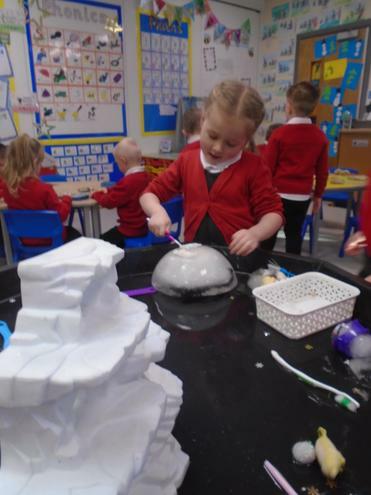 They have thought of ways theur can areate cosy warmer areas and have designed a castle for Elsa to live in. 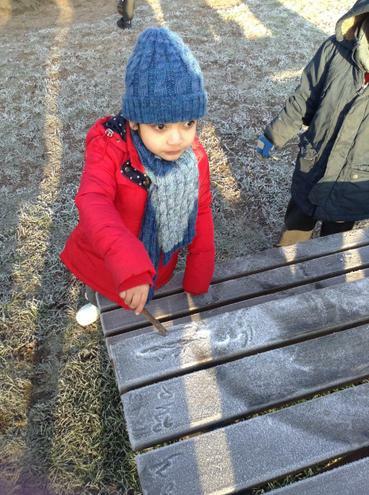 Fingers crossed she comes and uses her magic to share some snow with us soon! 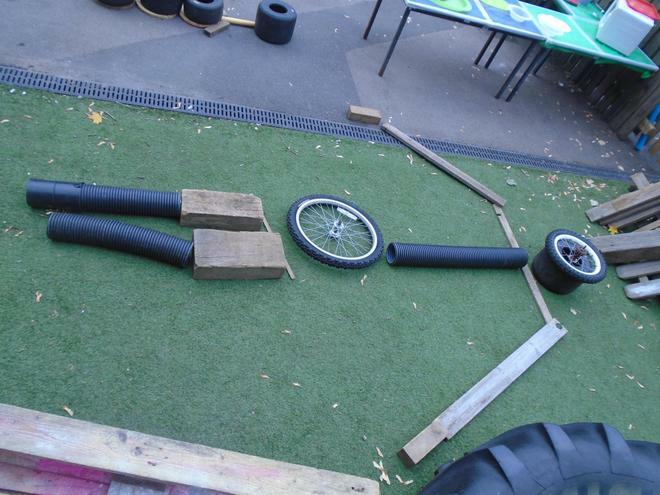 Who would live in a house llike this? 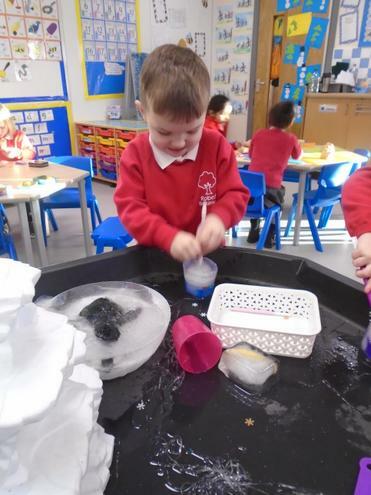 It's a little chilly in here! 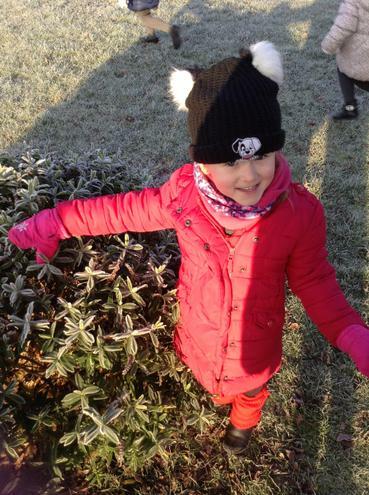 Which hat shall I wear today? 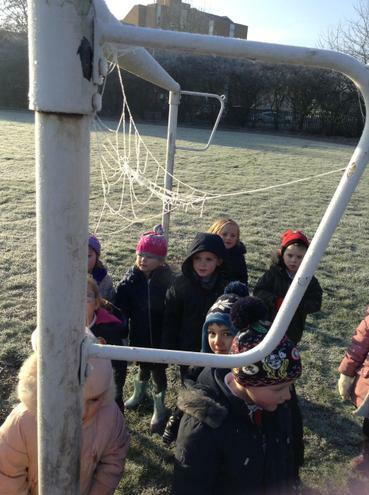 We found a frozen egg- what's inside? 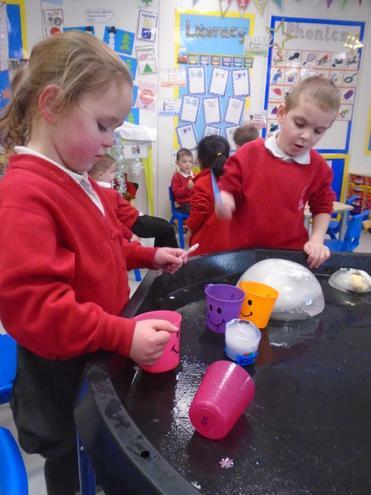 Fishing for sounds in the icy water. 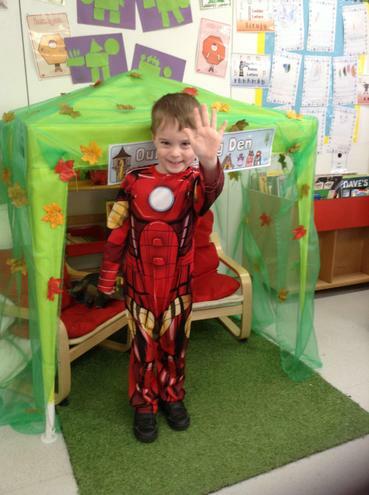 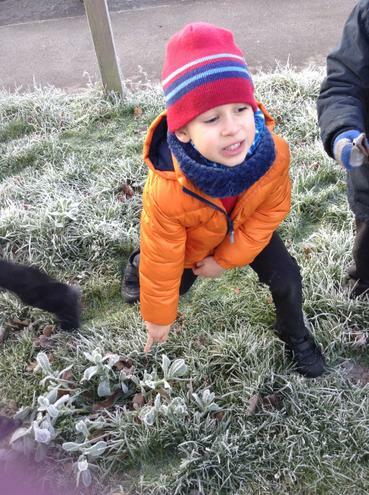 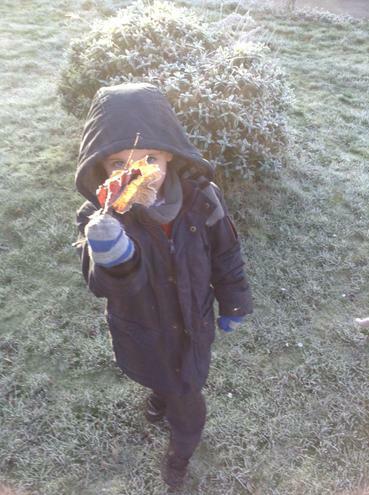 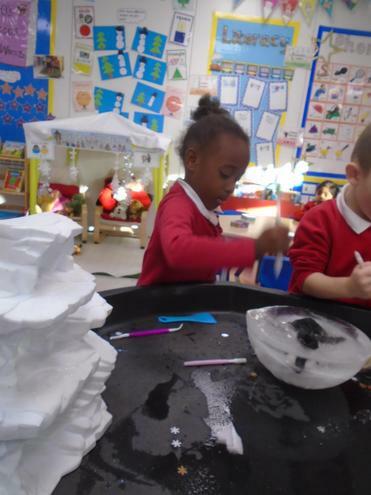 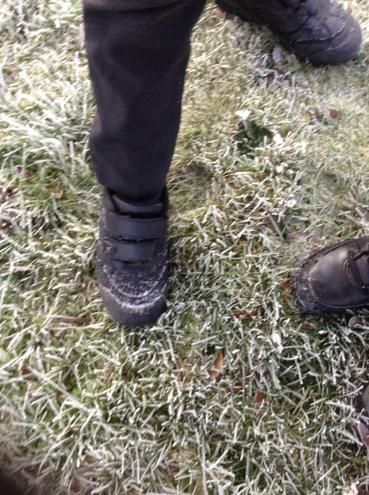 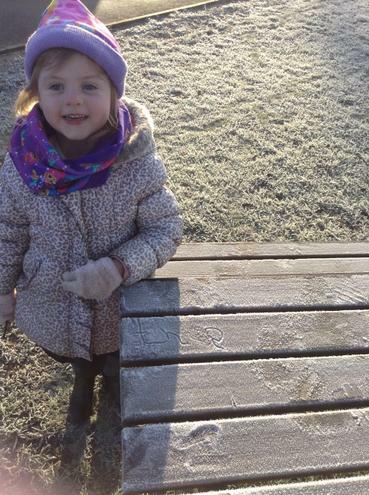 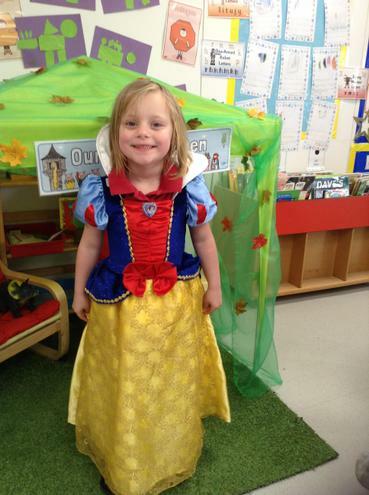 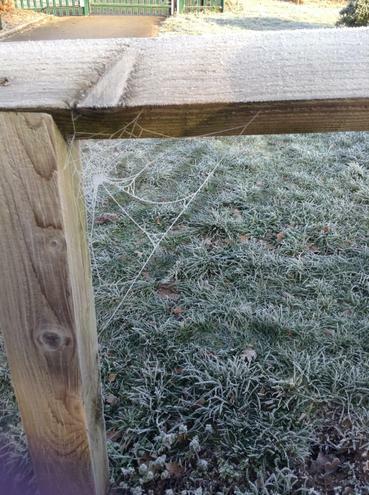 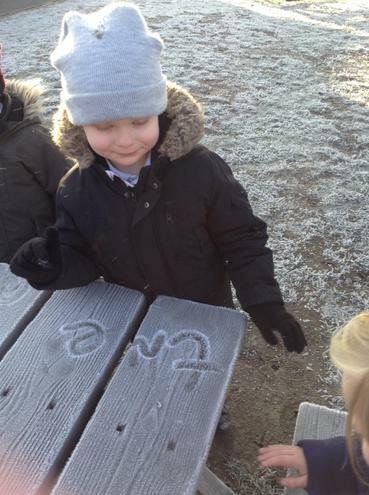 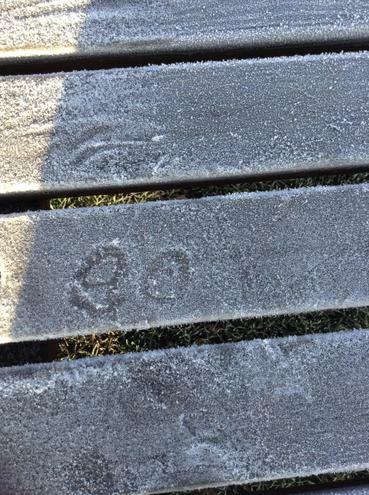 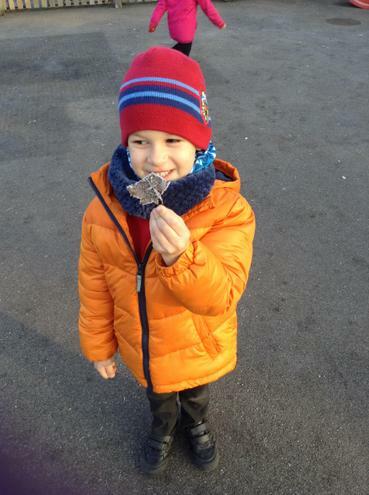 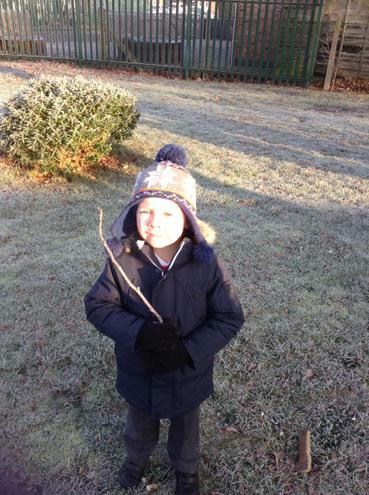 It seems that children do not feel the cold as they have enjoyed exploring ice in the classroom for hours! 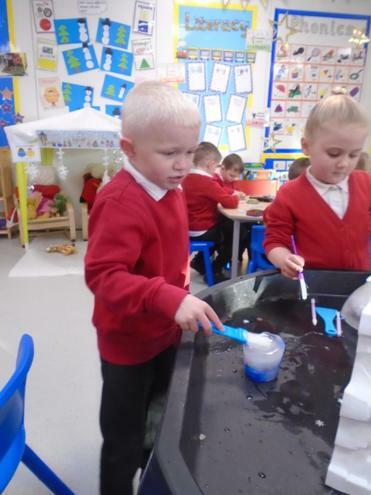 They have been trying to free the frozen objects using various tools from around the classroom. 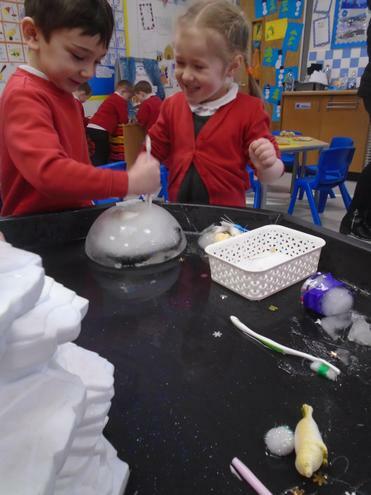 They have been keen to explain what is happening to the ice over time and have used great words to describe how it feel in different states. 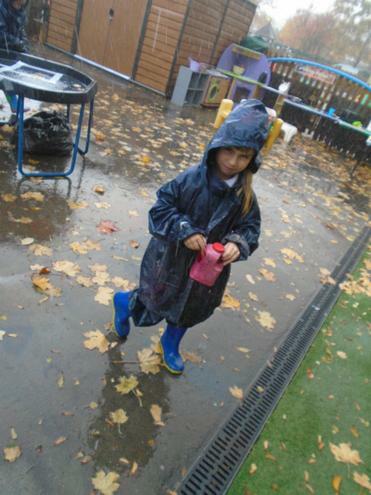 The children are having so much fun in both the indoor and outdoor classrooms. 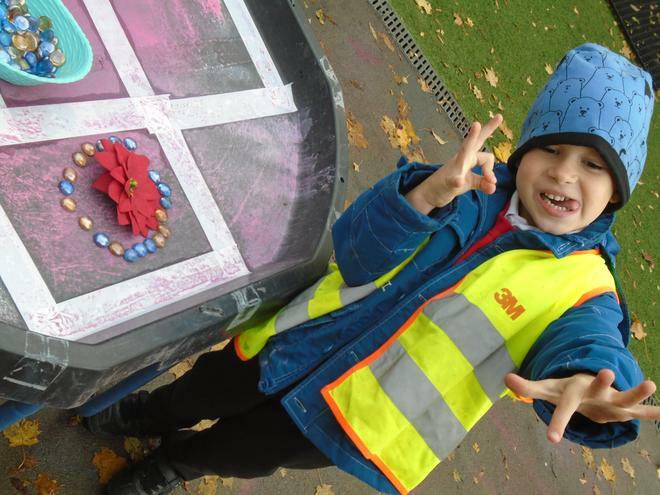 They have been very creative and decorated the areas with different mediums and lots of bright colours. 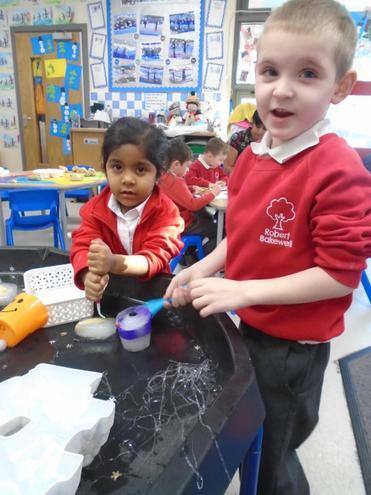 They have used these skills in various craft activities and even got to bake some mince pies and decorate bauble biscuits. 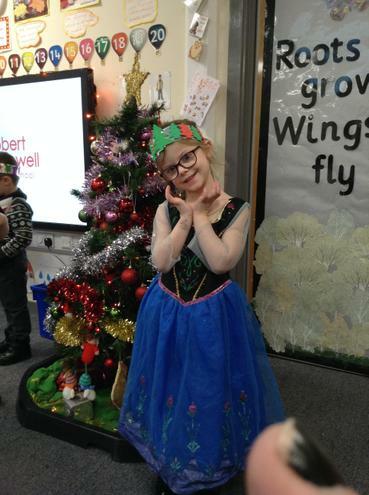 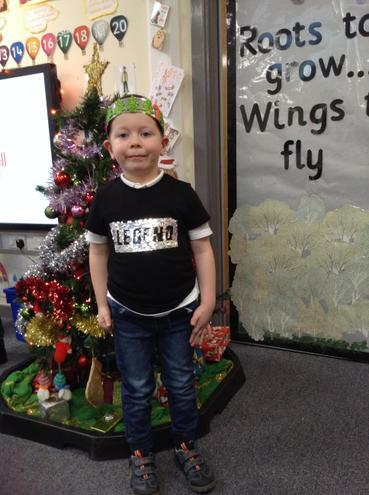 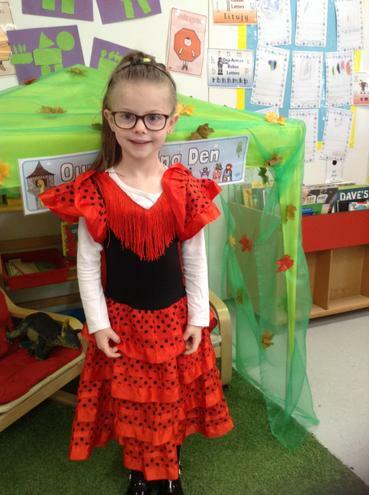 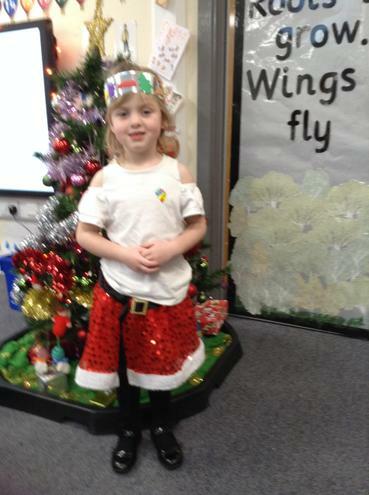 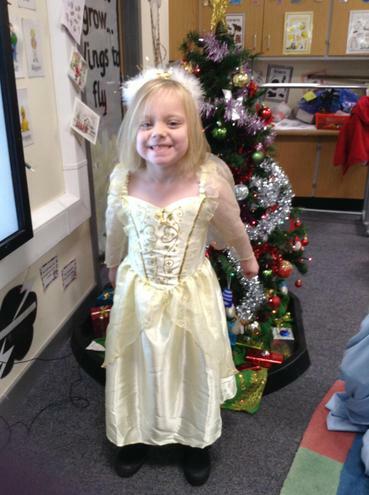 The children have also enjoyed their class party and showed some great moves on the dance floor. 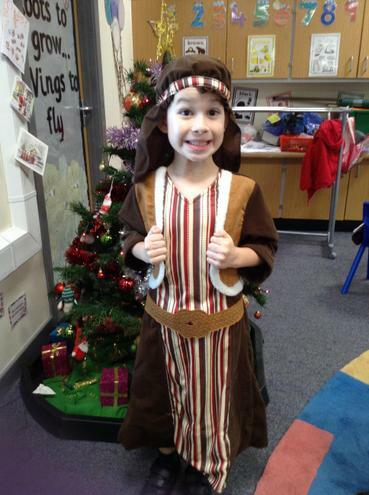 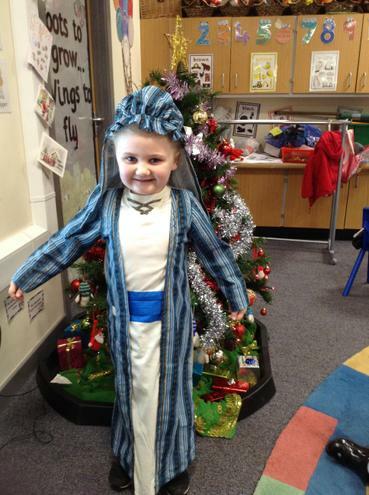 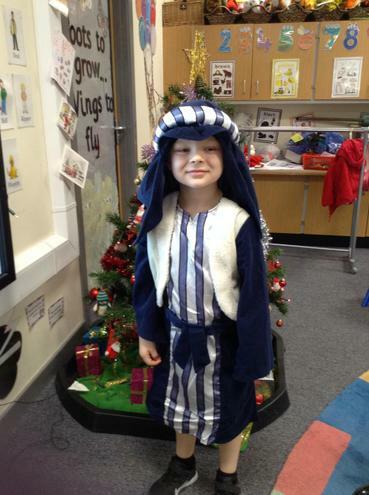 The children cannot wait for Christmas Day to arrive. 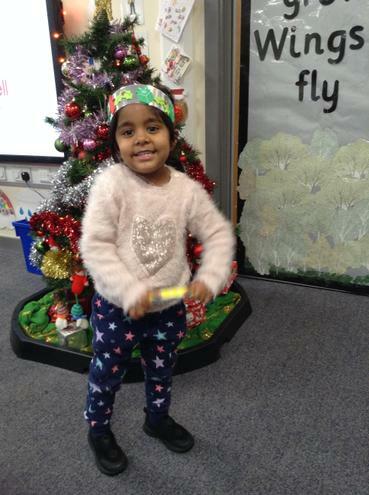 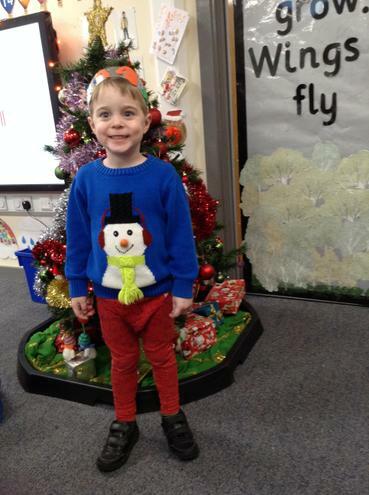 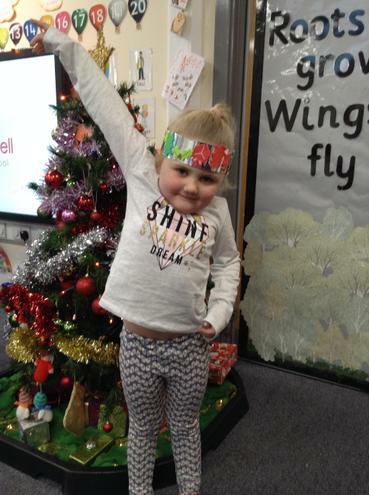 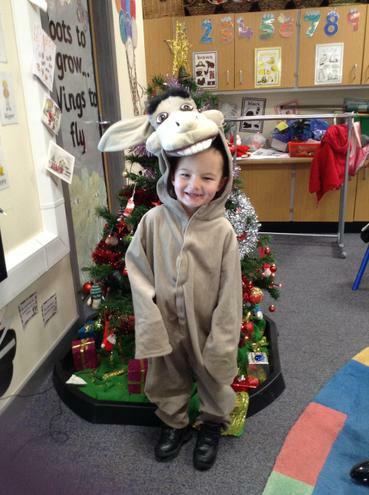 We hope you have lots of festive fun over the Christmas holiday and cannot wait to hear all the fun the children have had. 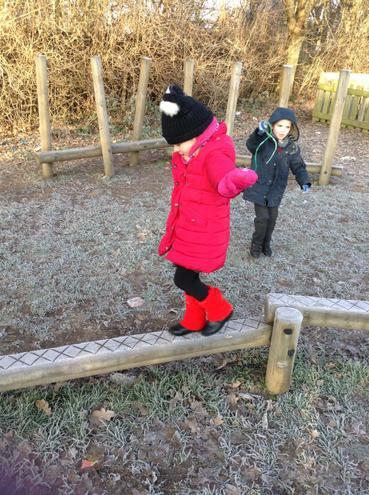 How many hats can I balance? 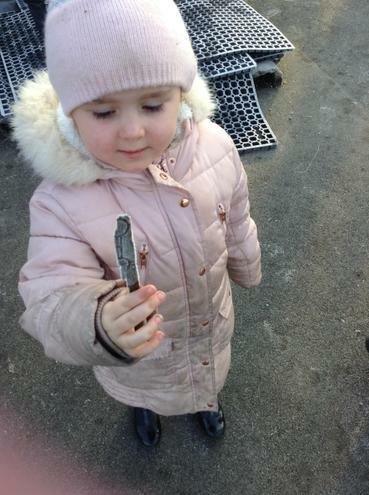 We're Going on a Baby Hunt. 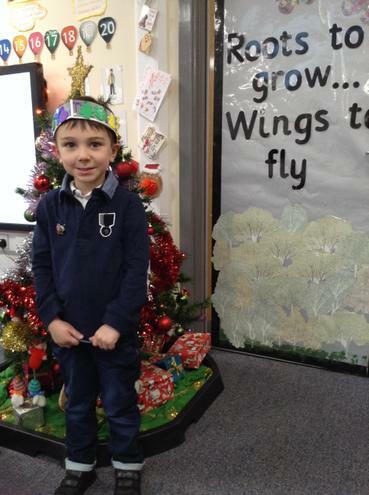 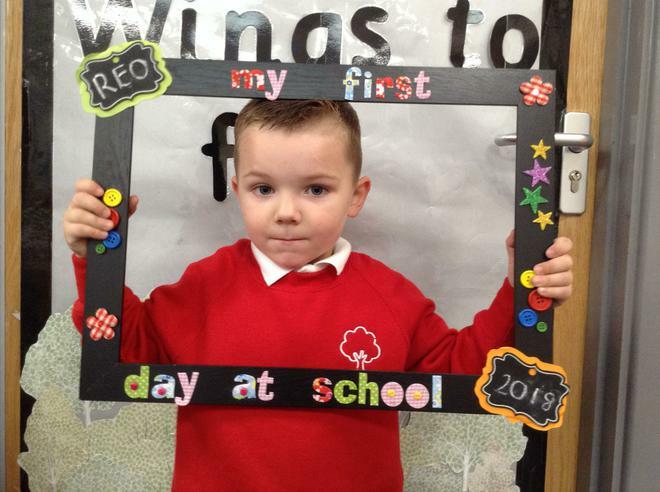 Words cannot express how super proud we are of all the children in Reception. 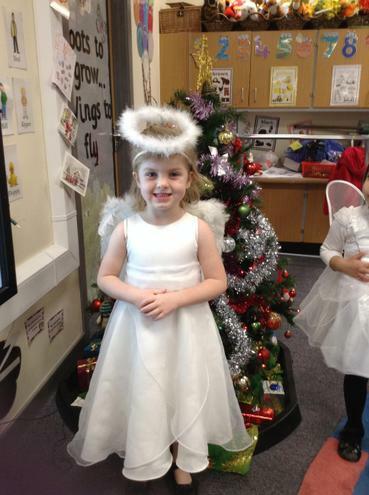 They gave a fantastic performance to family members today and danced and sang their hearts out. 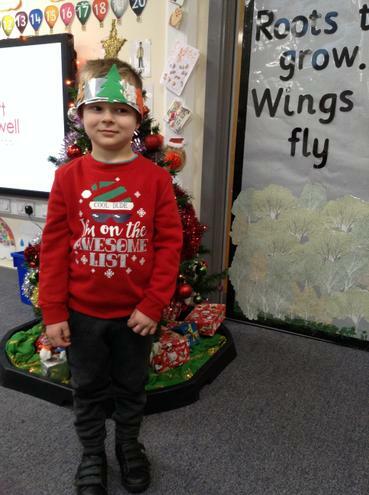 Not a dry eye could be seen in the room, and that's just the staff! 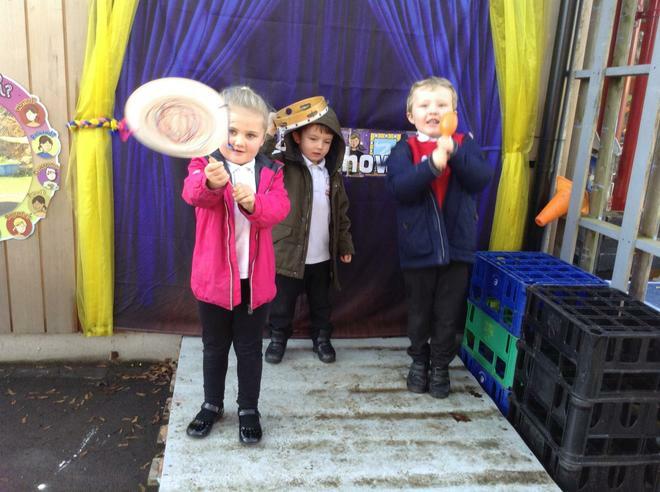 The stars of our show. 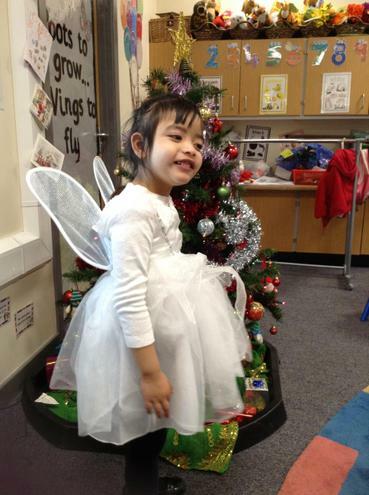 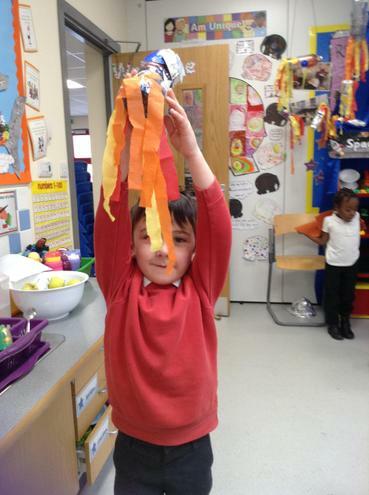 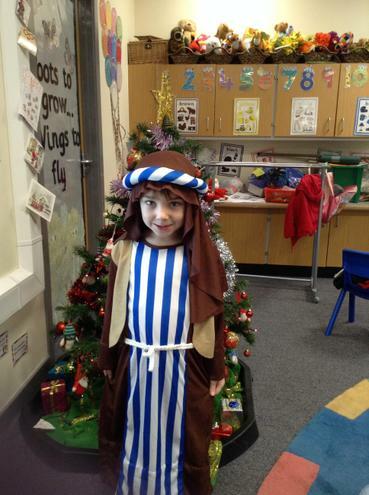 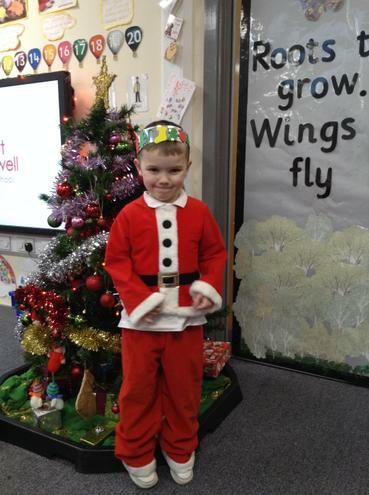 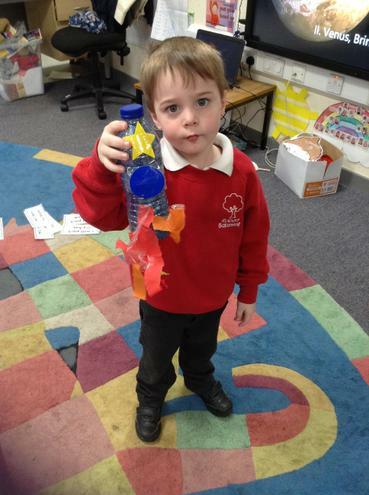 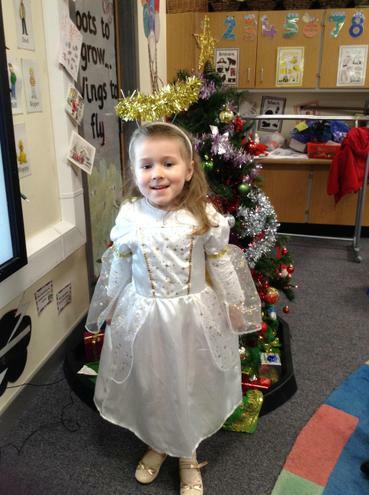 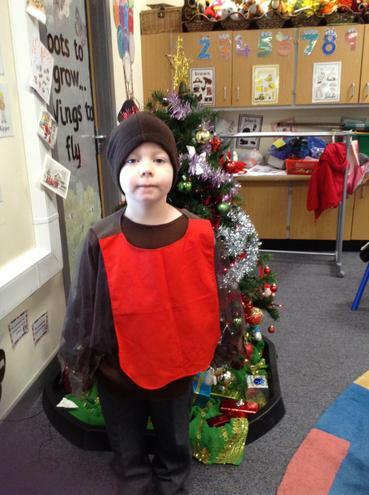 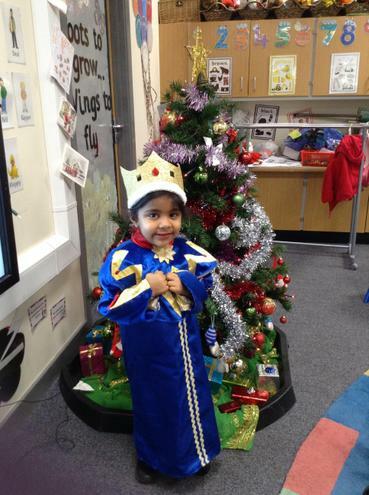 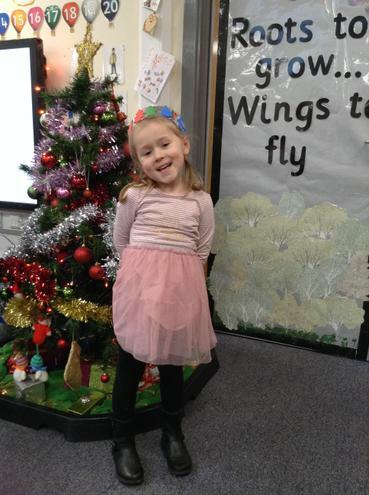 The children had great fun decorating the class tree. 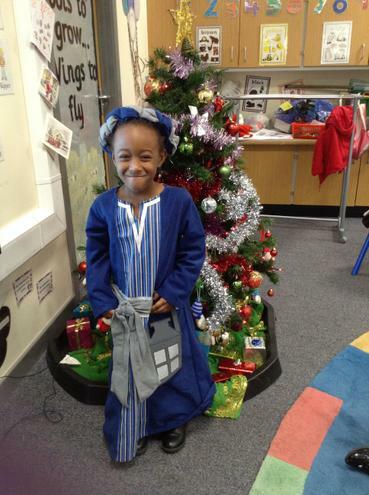 They are really excited about all the festive fun that is happening around them and are eager to share their experiences of Christmas. 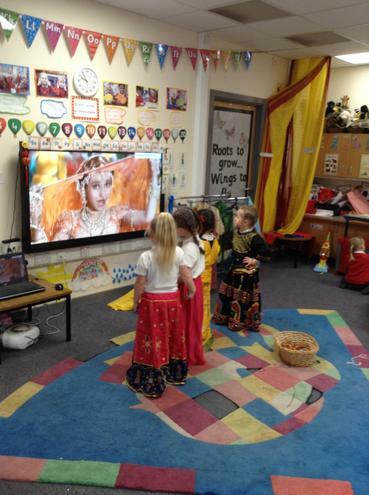 The children enjoyed watching the panto show 'Aladdin'. 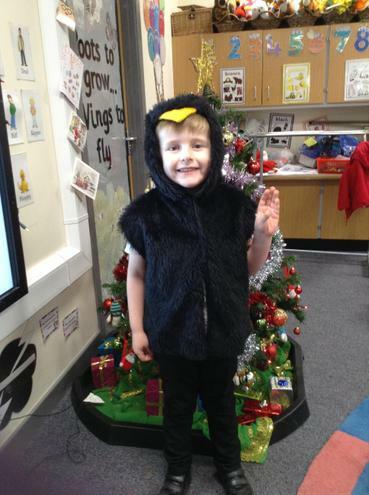 They enjoyed the funny antics of the characters and loved booing and hissing at the evil character too! 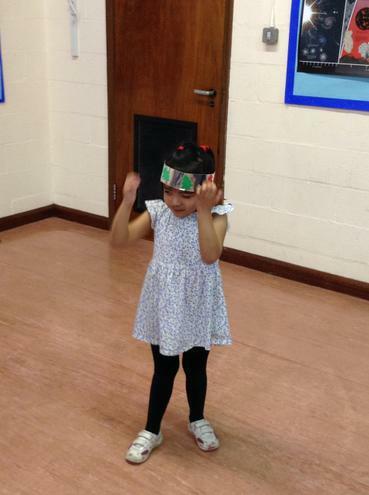 The children showed off thier floss skills and encouraged thier teachers to join in too! 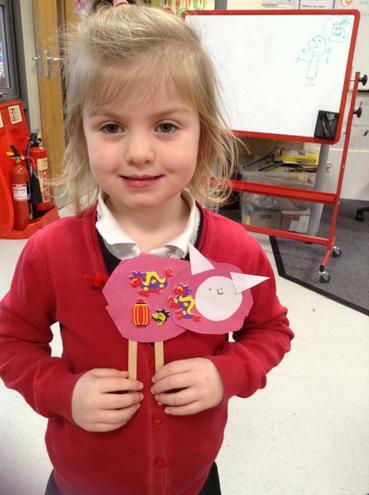 Children used the story of Elmer to discuss how being different to one another is a great asset. 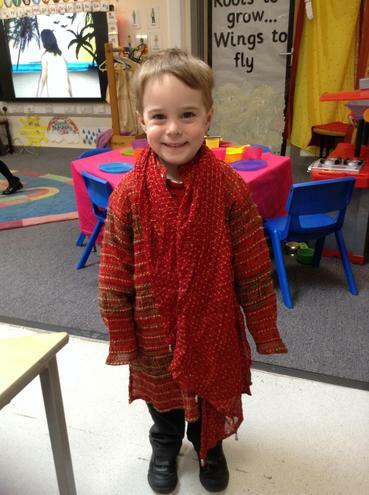 That we are all individual and should celebrate our uniqueness. 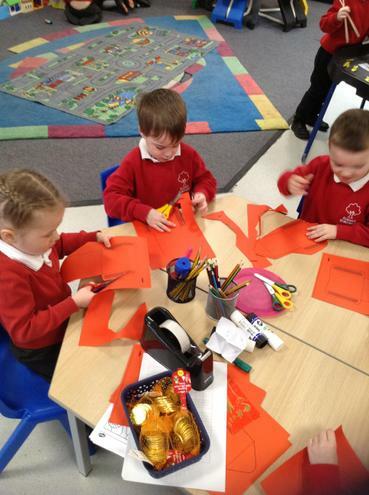 We talked about our friends and shared stories about what we enjoyed doing together. 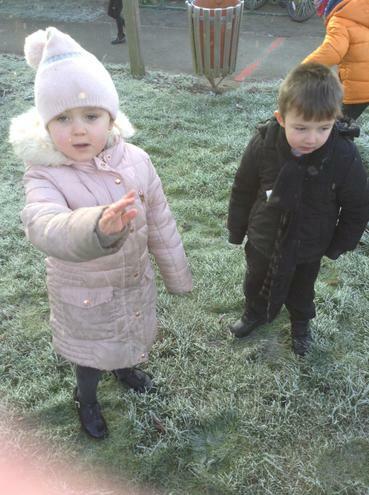 The children then went on to discuss ways in which sometimes children can be unkind to one another and what we should do when this happens. 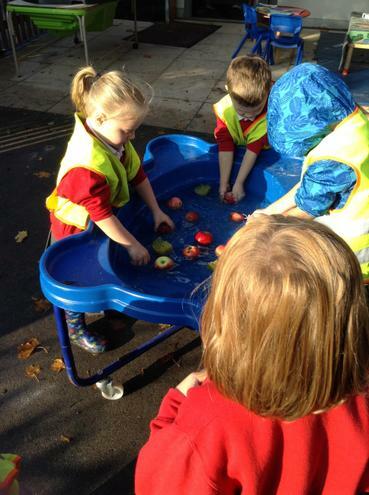 I showed children an apple that looked nice and healthy on the outside. 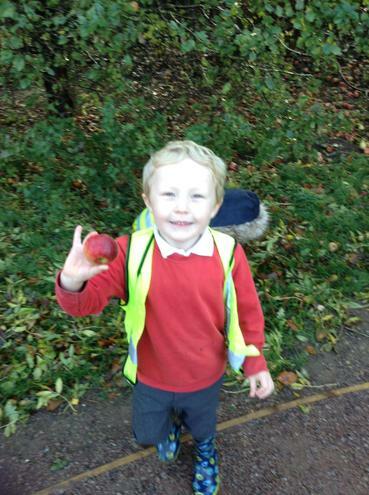 I then asked the children in turn to pass the apple around and say something mean to it. 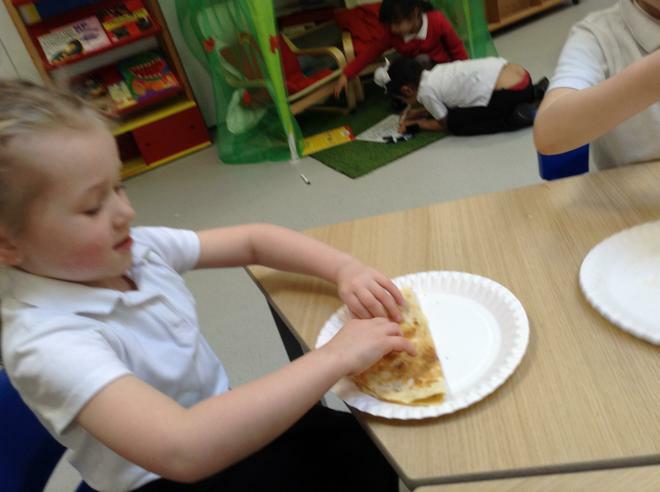 I then cut the apple in half to reveal bruises on the inside. 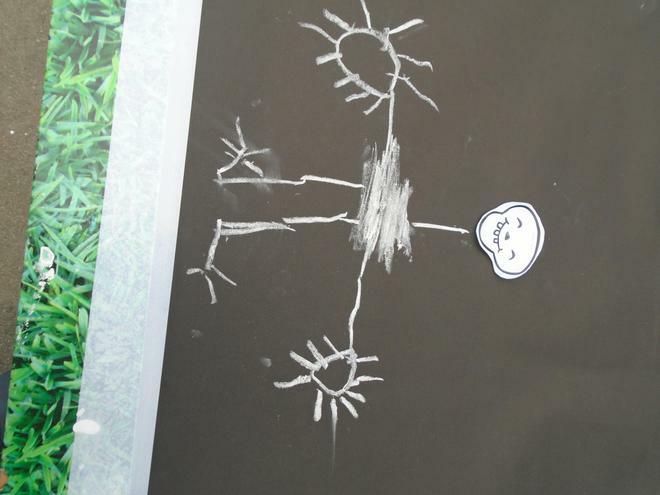 The children were shown in a visual way that our words can hurt people on the inside too. 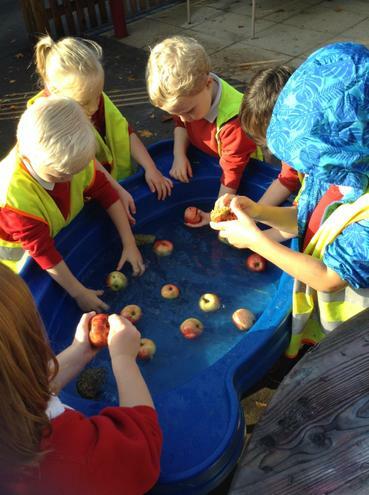 Some children were really moved by this and apologised to the apple. 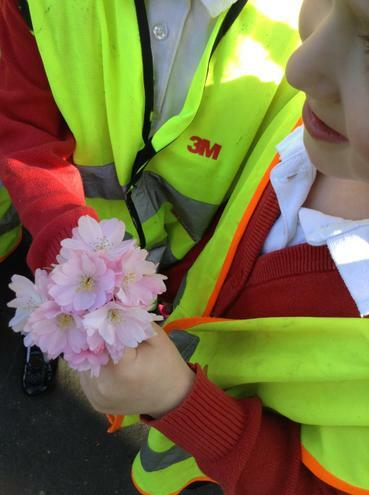 We have had a very busy couple of weeks exploring colour around us. 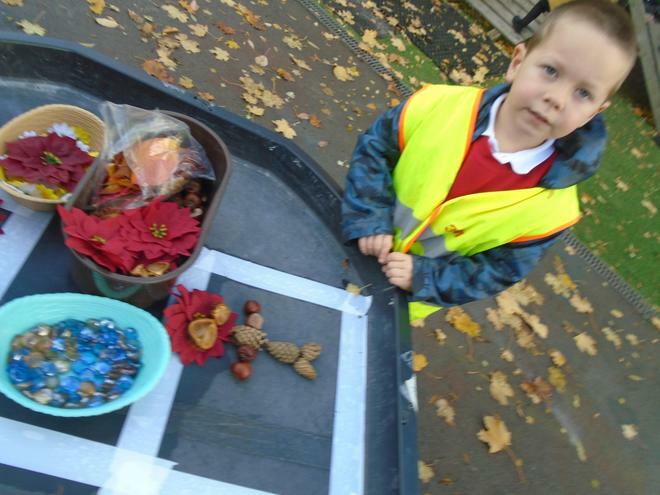 The children went on a colour walk outside to try and find natural objects from nature that matched the colour words on our chart. 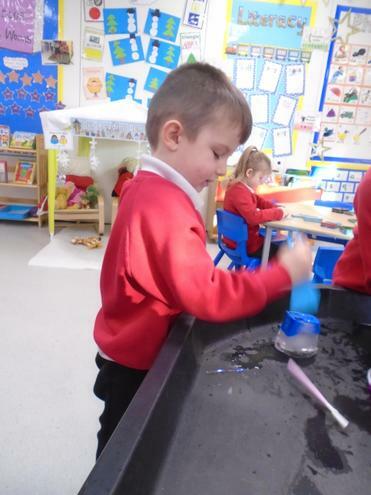 The children have enjoyed being messy and have been exploring what happens when we mix primary colours together. 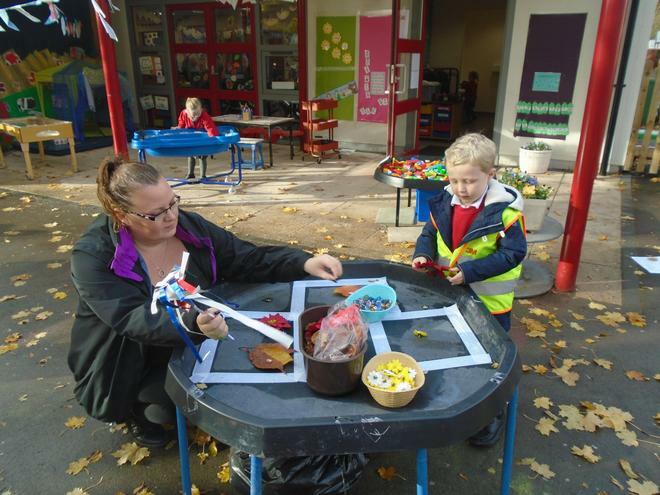 The children have enjoyed listening to various books with the colourful character Elmer and had great fun making their own Elmer out of milk carton and colourful paper. 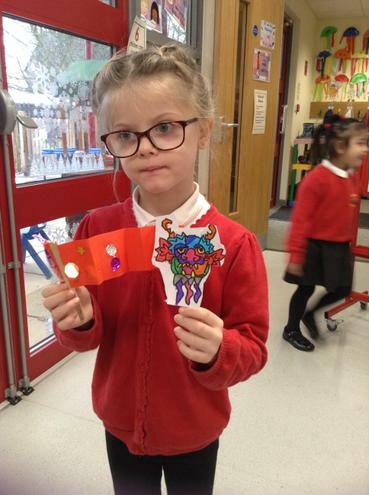 The children were introduced to the artist Kandinsky and discussed the colours and patterns used in some of his work. 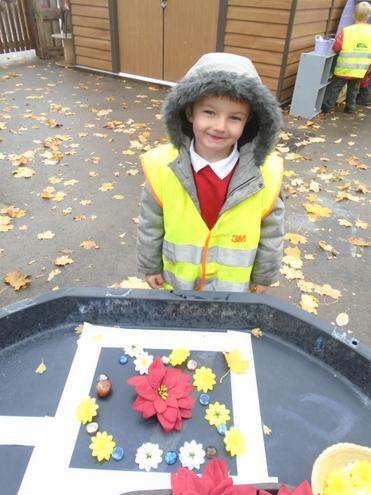 The children then created their own work in his style both inside and outside. 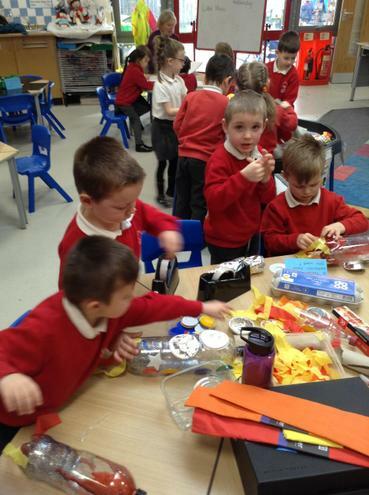 Future Kandinsky's in the making. 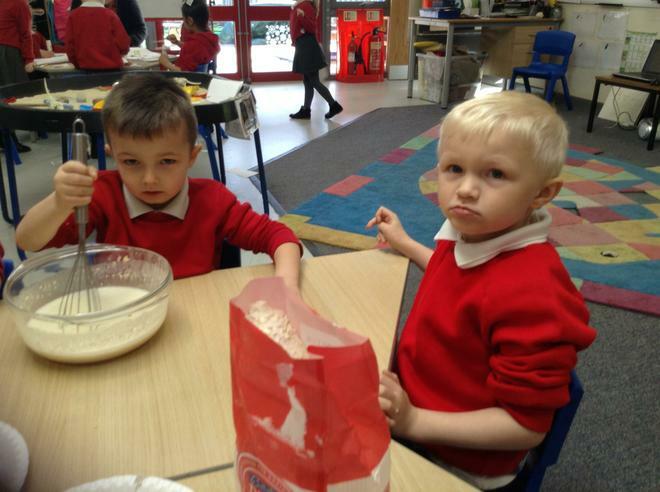 The children are having fun baking chocolate chip cakes with Mrs Murphy. 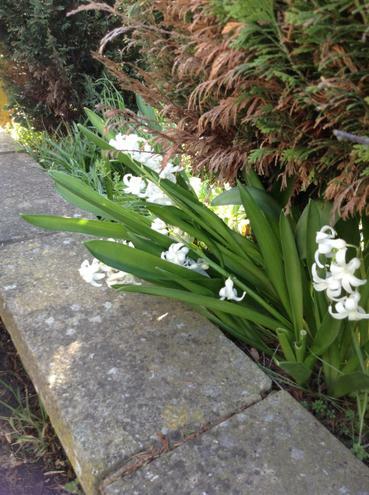 They smell so yummy but I am yet to try one! 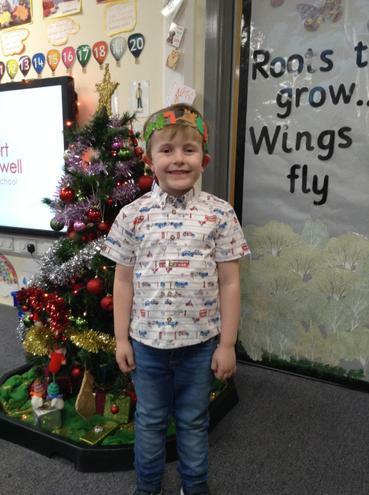 The children are becoming more aware of why poppies are worn at this time of year and are aware that sadly many lose lives during battle and that thousands of lives were lost during the First World War. 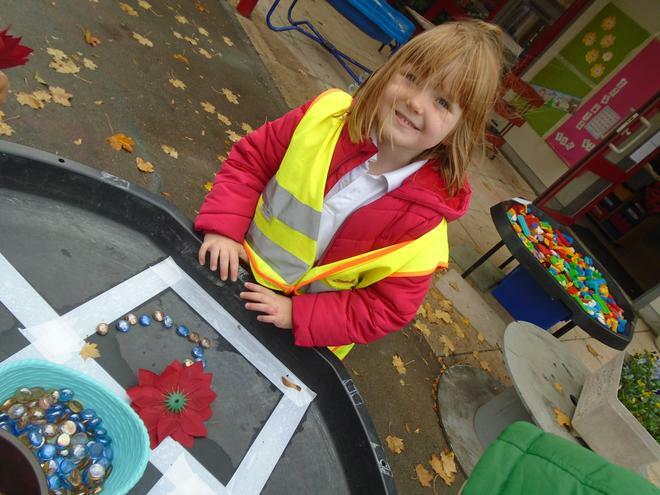 The children helped make poppies for the local 'Songster' project and have made their own poppy garden of rememberance outside. 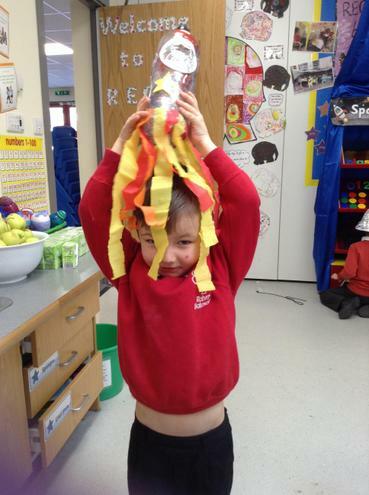 Wow, what a week of celebrations we've had. 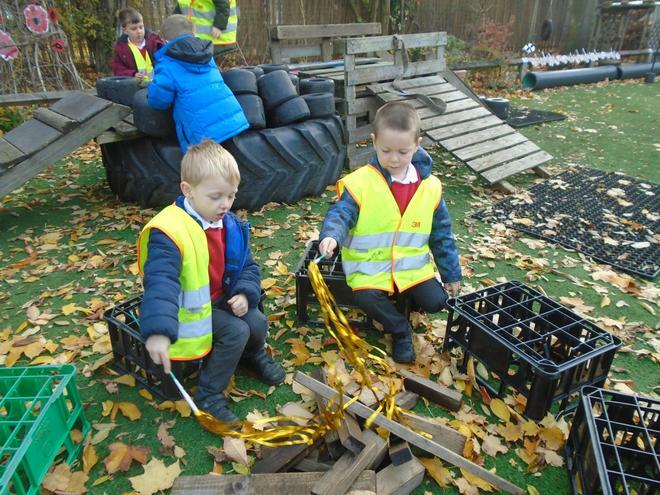 We began the week learning about why we celebrate Bonfire Night and discussed ways in which we can keep ourselves safe when enjoying fireworks. 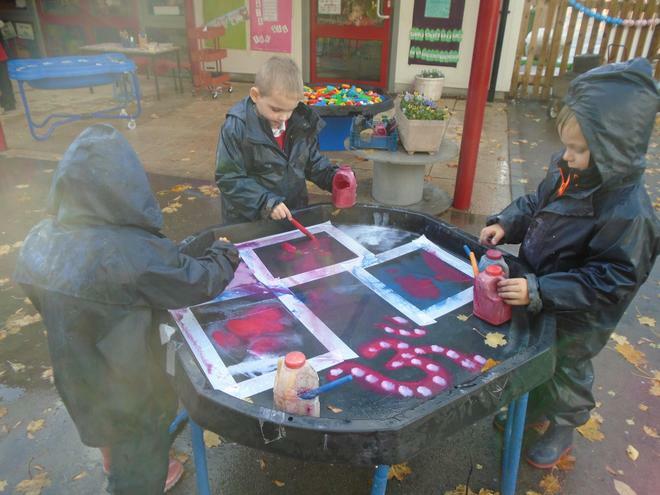 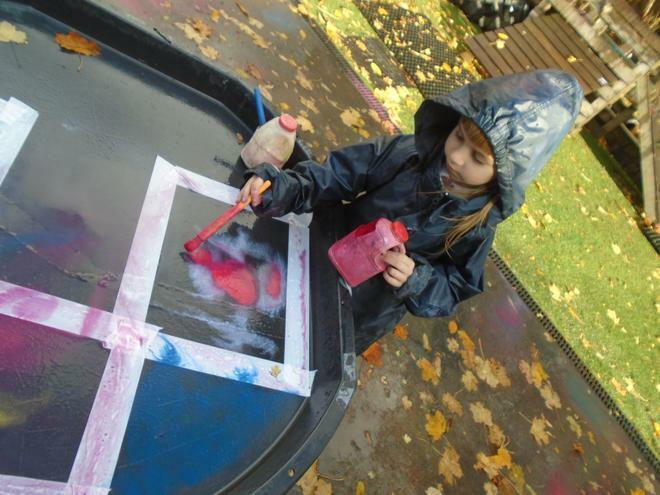 The children explored what happens when you mix red and yellow paint whilst making bonfire pictures. 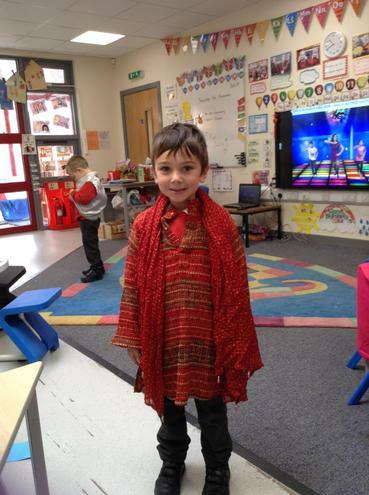 On Wednesday we celebrated Diwali with our friends and family. 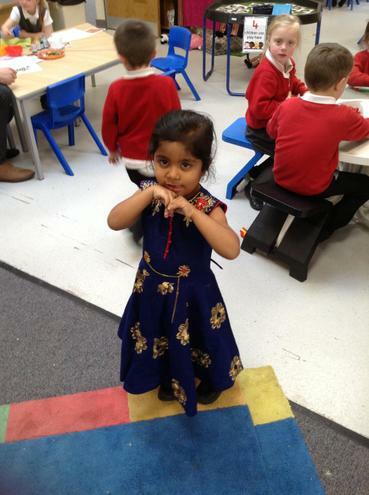 First we watched a video of Jessica, a young Hindu girl from Leicester, showing us the preparations she and her family made for Diwali. 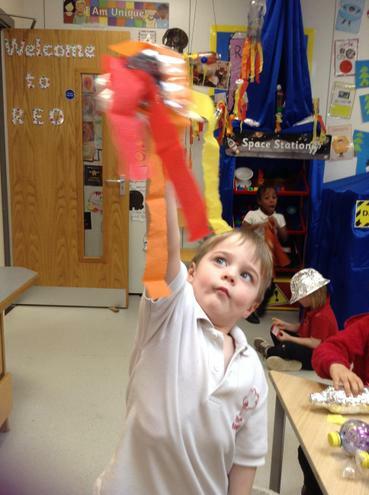 We then heard the story of how Prince Rama defeated the evil 10 headed Ravan to help recue his wife Sita, with the help of Hanuman the monkey king. 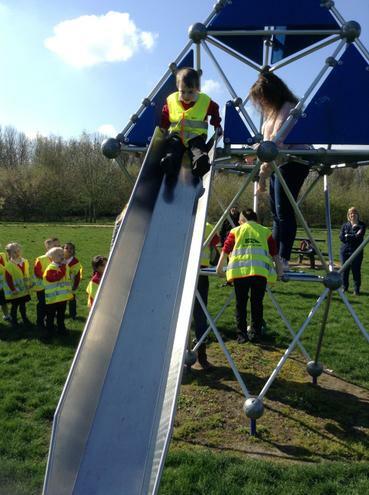 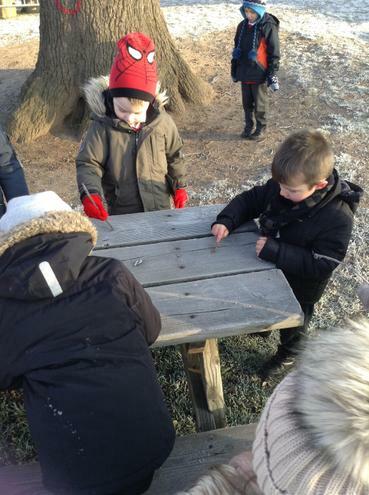 The children then went off to our huge joint classroom to enjoy a range of wonderful activities throughout the day. 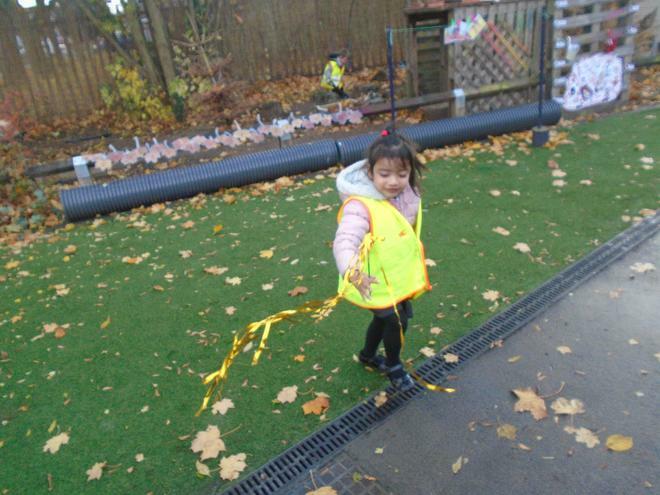 Read this terms newsletter and see this terms new topic maps. 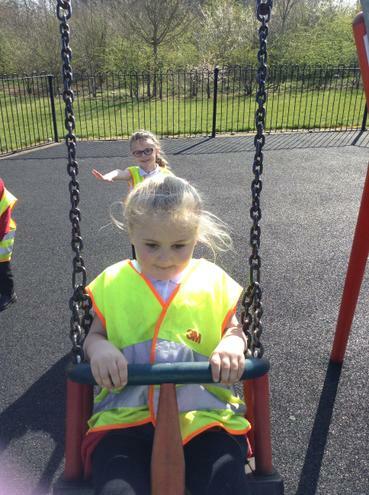 What colours can you see? 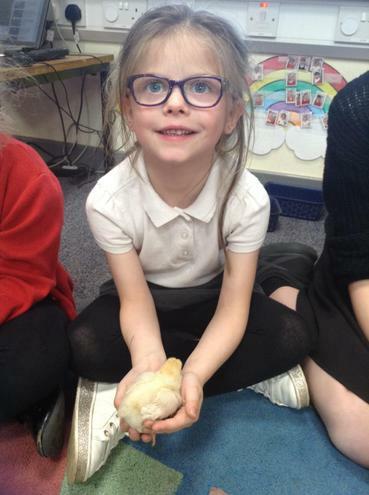 The children are beginning to understand the term nocturnal and have enjoyed finding out about some animals that like to come out at night. 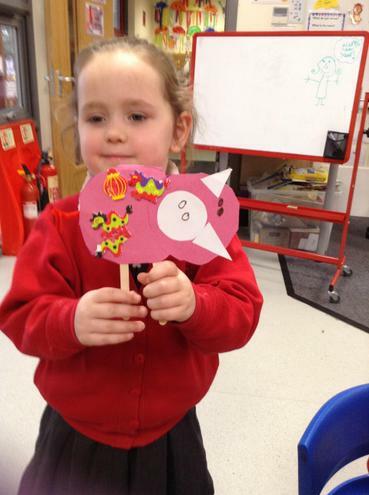 They have learnt a few simple facts about owls and can recall them with some fun actions. 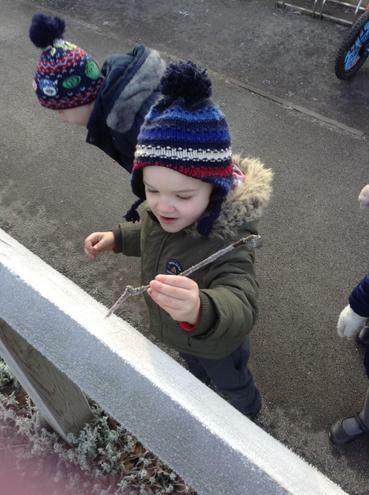 On Friday the children were visited by some young spiky friends who should have been curled up asleep! 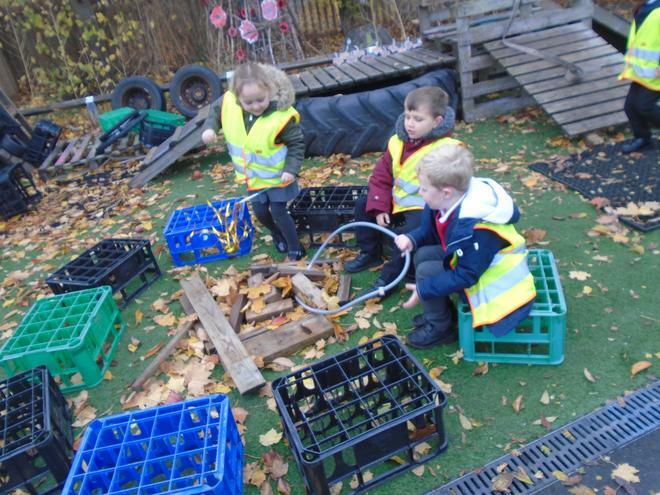 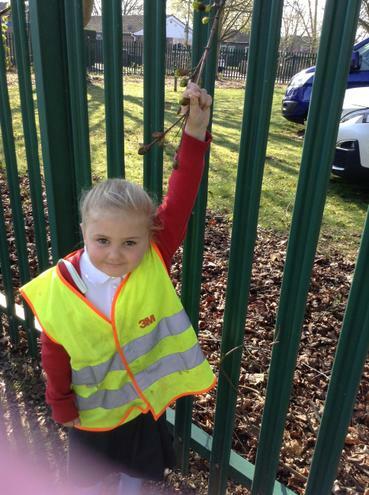 The children learnt ways in which they can help hedgehogs during the colder months. 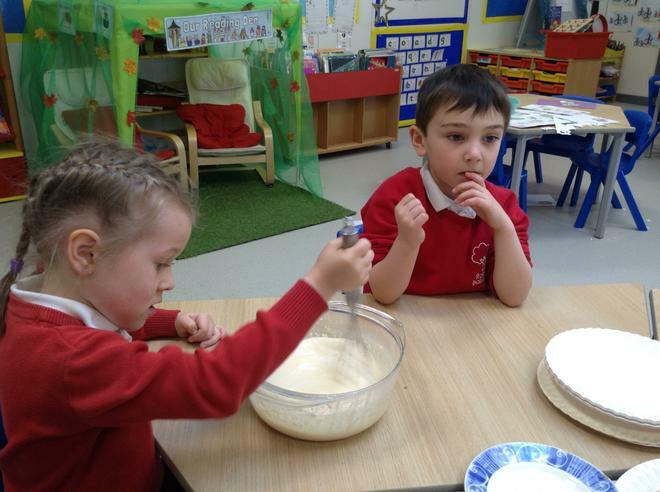 The children also enjoyed baking dough which they had shaped into tiny hoglets. 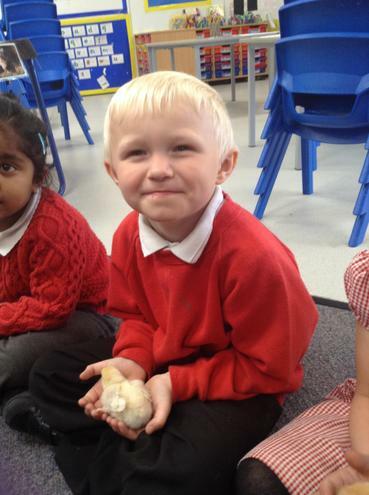 The children have been learning about what the term 'harvest' means. 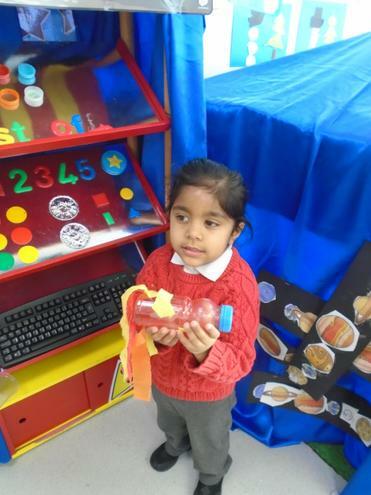 We have talked about how food that we can readily buy in the supermarkets starts off being tiny seeds that are planted by farm workers. 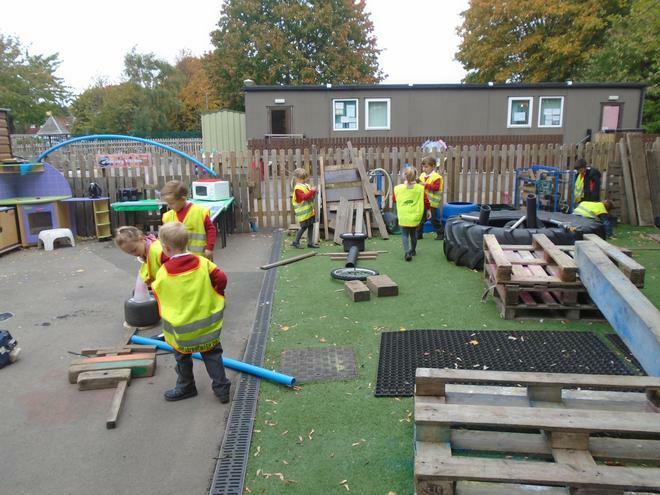 We have watched videos on food being harvested and and then sent off to factories where they are cleaned and sorted before being sent to markets and shops. 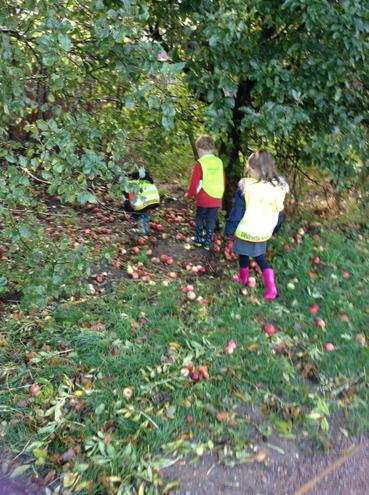 We have harvested some apples ourselves from the trees in the field. 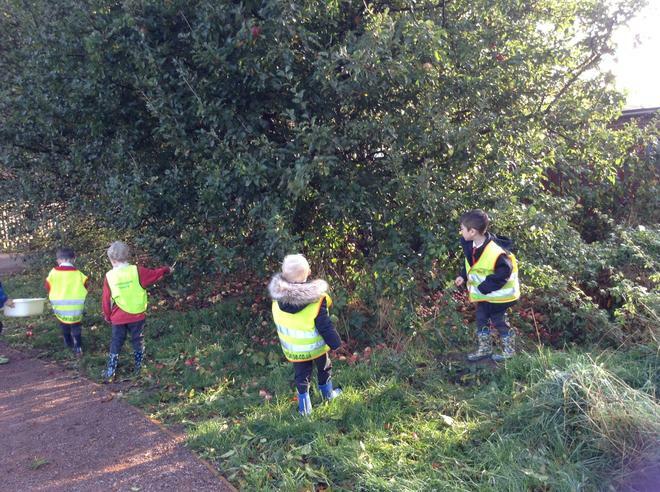 The children enjoyed picking the ripe apples that had fallen and have washed them ready to be sorted into edible or rotten piles. 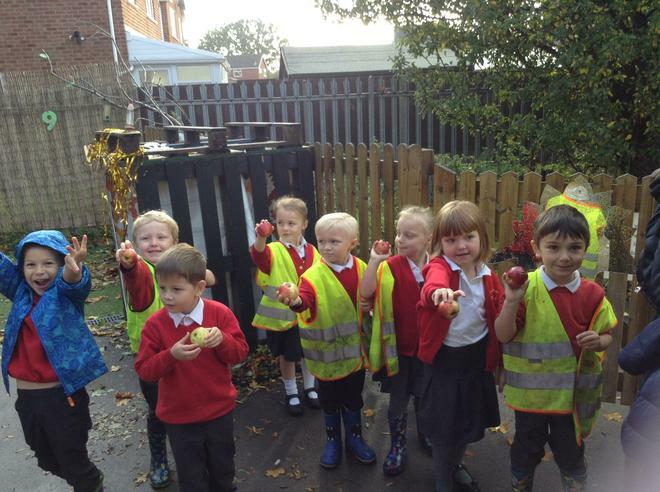 The edible apples will be shared after half term and the rotten apples will be left to decompose and make yummy compost for the garden. 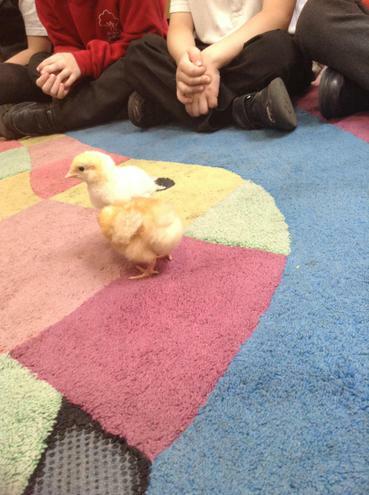 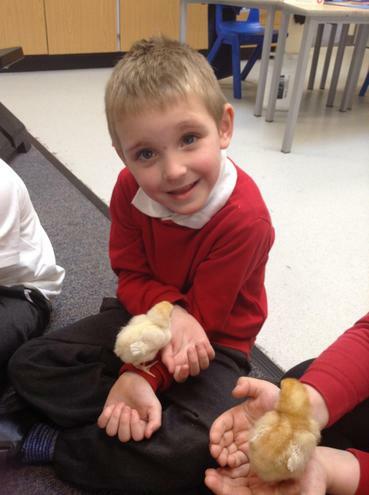 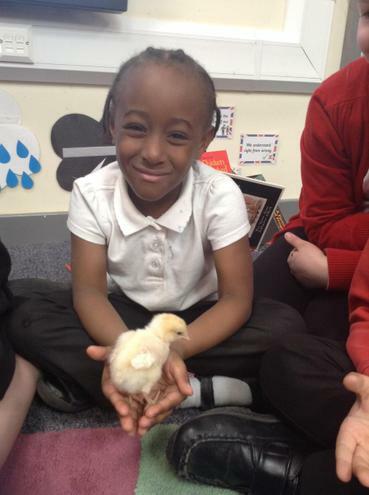 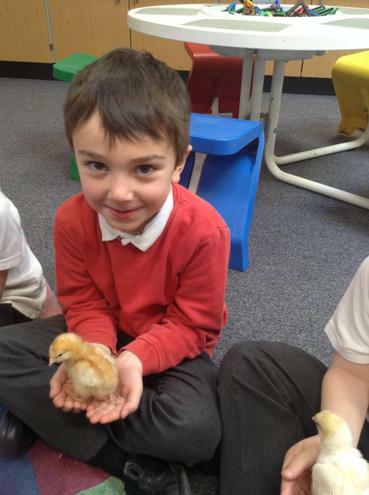 The children have also learnt the story of The Little Red Hen and have used storymaps to help them re tell the story. 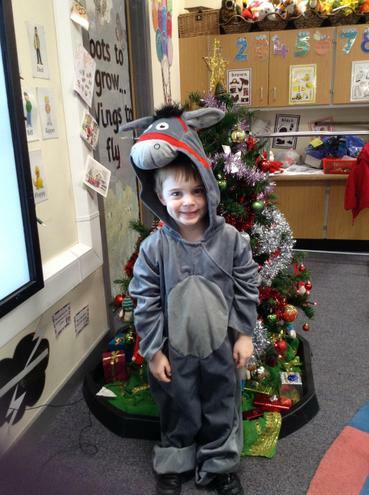 Please ask your child to re tell this wonderful story to you. 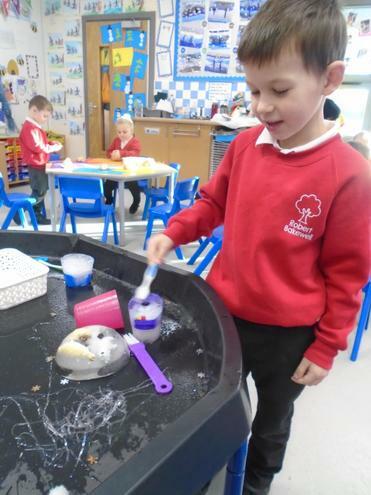 The children have been learning about how our 5 senses allow us to learn about what is happening around us. 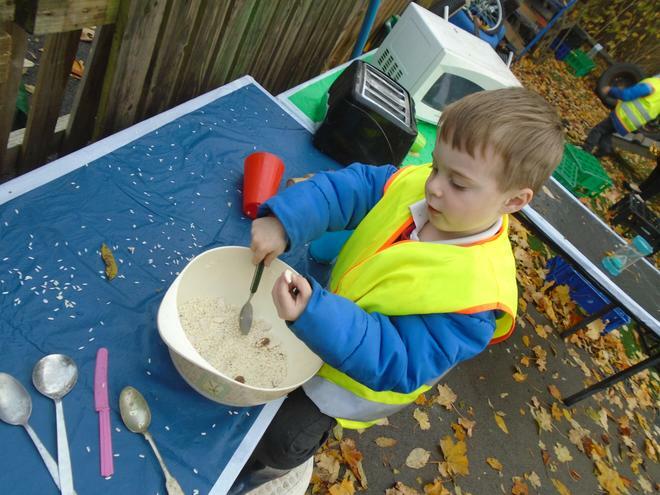 We spent a day focusing on the senses and had fun exploring them through practical activities. 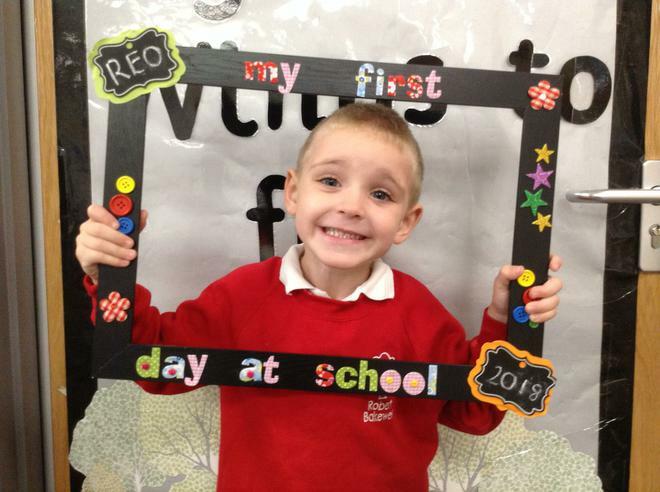 What made the day even more special was that we were joined by our friends from REA too! 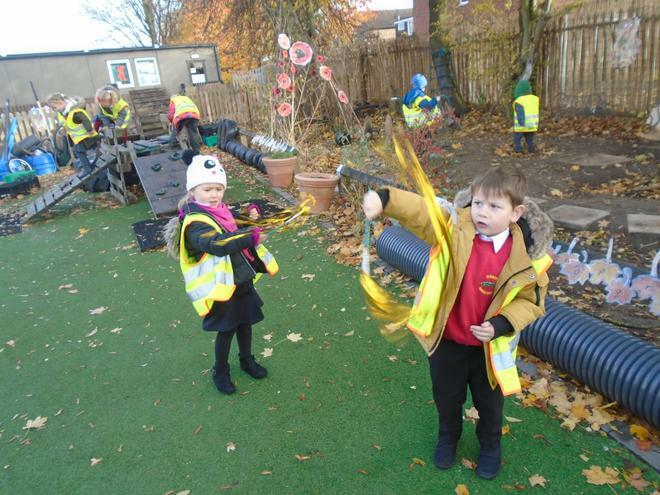 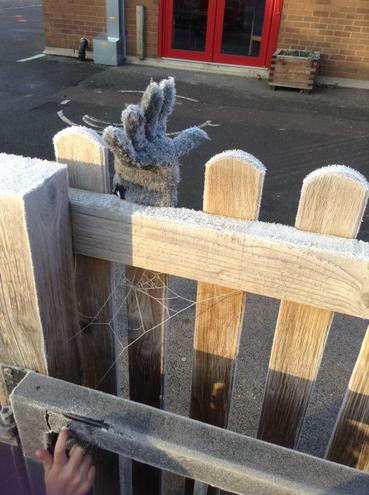 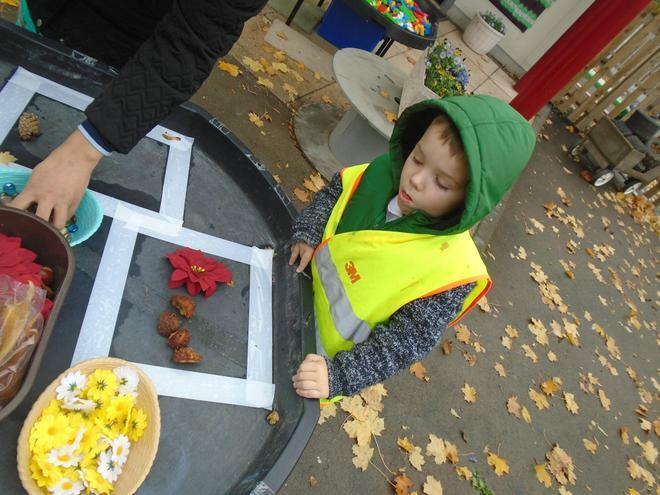 We used our feely fingers to explore a range of objects with different textures in the outside classroom. 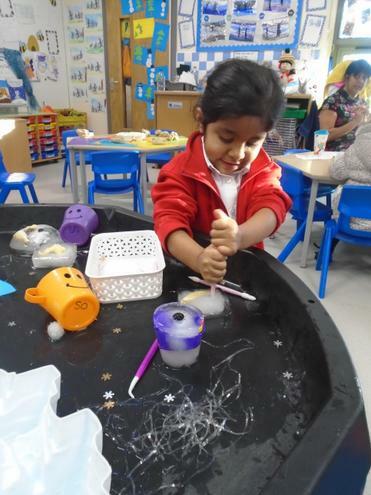 We talked about how the objects felt and learnt words to describe them such as rough, smooth, prickly, gooey, hard soft etc. 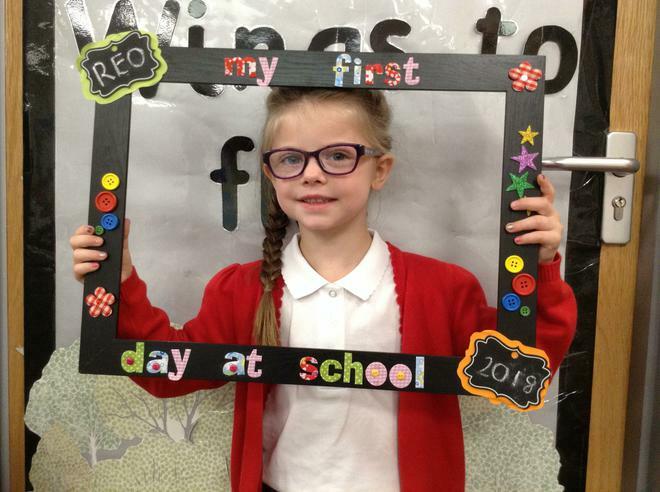 We made some fantastic glasses with coloured lenses to see the world in a different light. 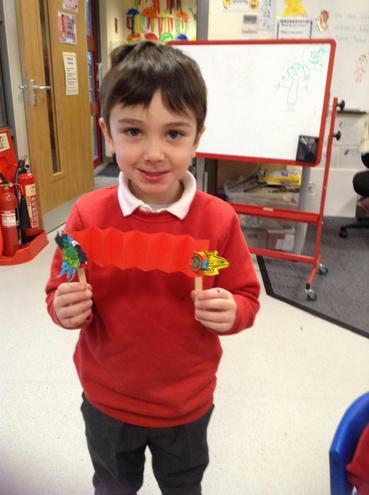 After hearing the story of The Hungry Caterpillar the children made a tasty caterpillar of their own to munch on. 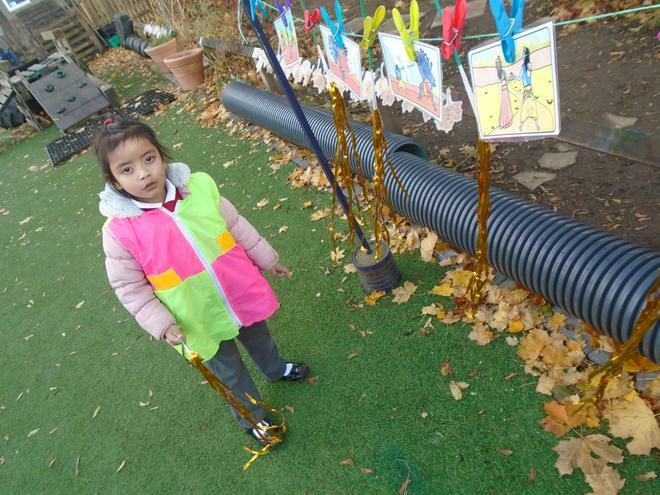 We went on a sound walk in and around our school. 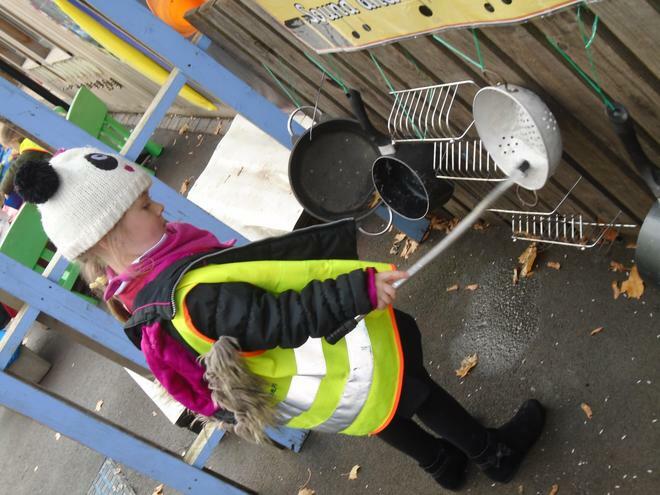 We heard lots of things such as children and teachers chatting, leaves rustling, cars driving by, pots and pans banging in the kitchen and much more. 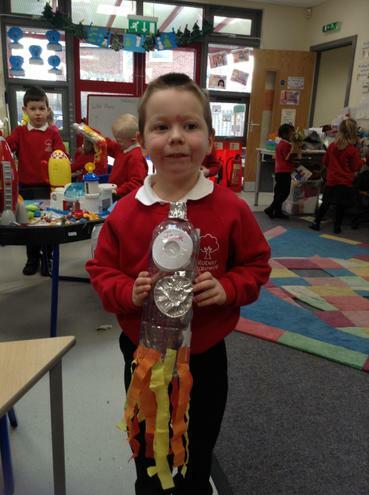 What can you hear around you now? 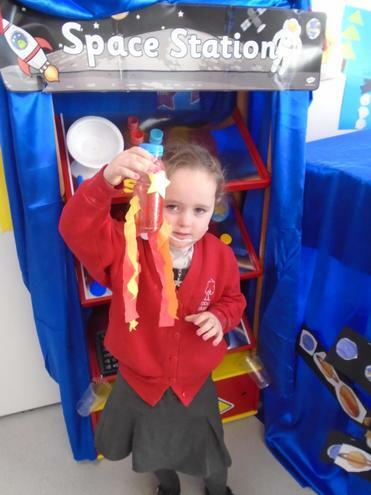 Children had great fun trying to guess the smells in the jars. 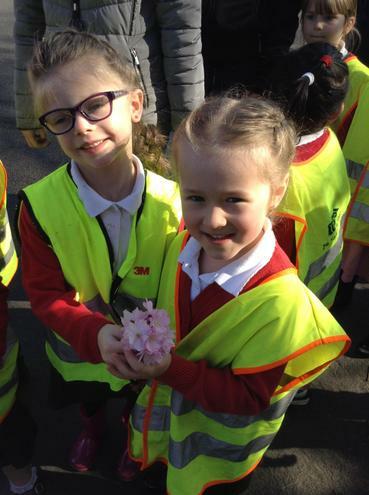 They smelt of mint, garlic, fish, flowers or chocolate.They then picked their favourite to make smelling flowers to take home for their family to take a sniff at! 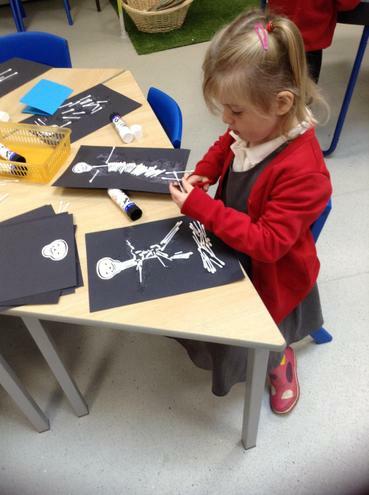 The children have also been using a range of materials to make skeletons both inside and outside. 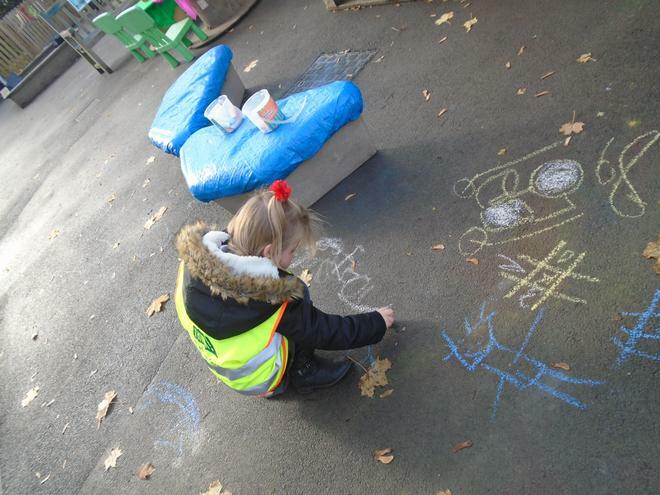 The children are learning about what keeps their body from being a blob on the floor. 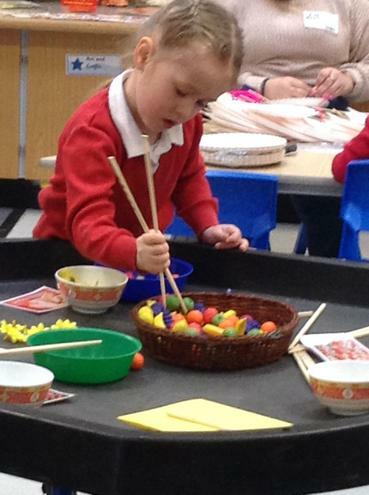 They have enjoyed learning songs that help them remember some of the bones we have in our bodies. 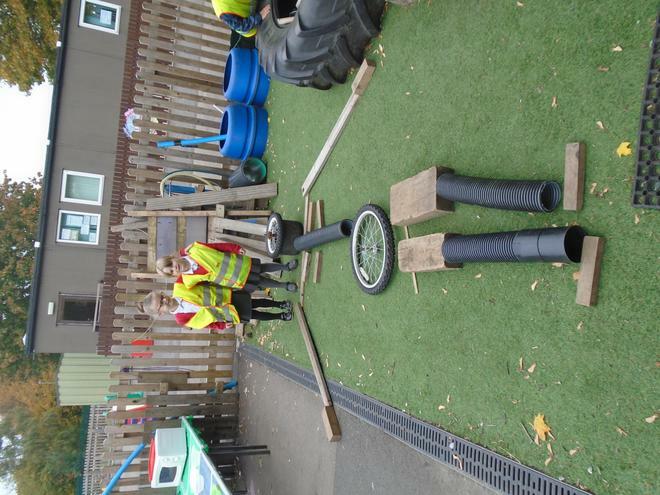 We worked together to make a big skeleton. 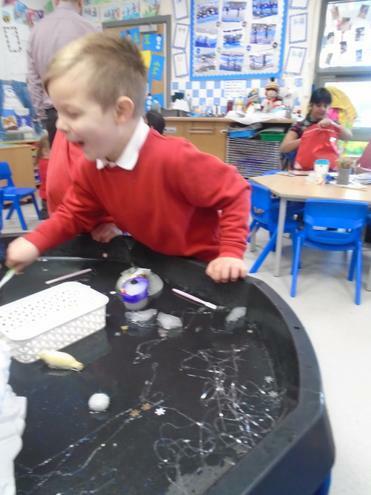 The children continue to have fun making faces. 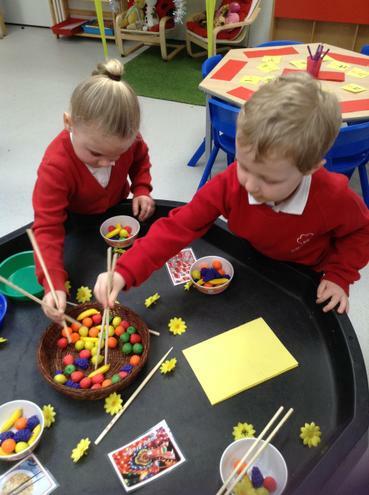 Come and look at our loose part faces and our Mr and Mrs Potato Heads. 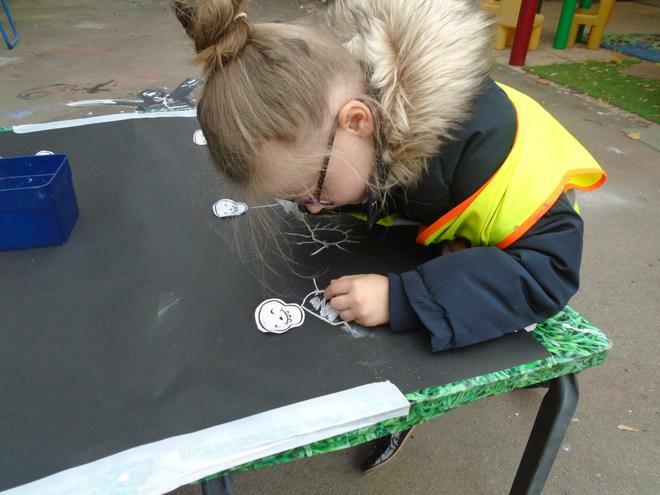 The children are having great fun making pictures of themselves using a range of media. 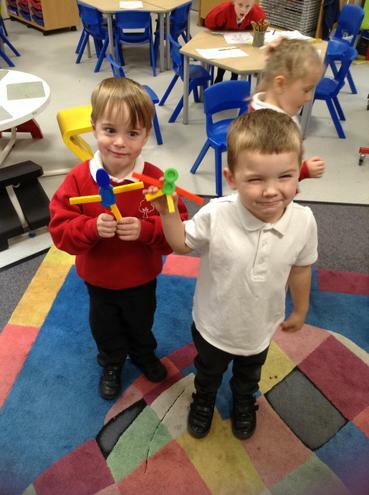 Here the children had fun learning about 2D shapes as they used them to make shape people. 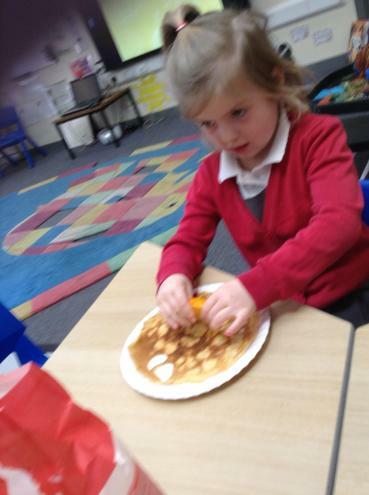 We talked about sides and corners of each shape and are becoming more familiar with the names of them. 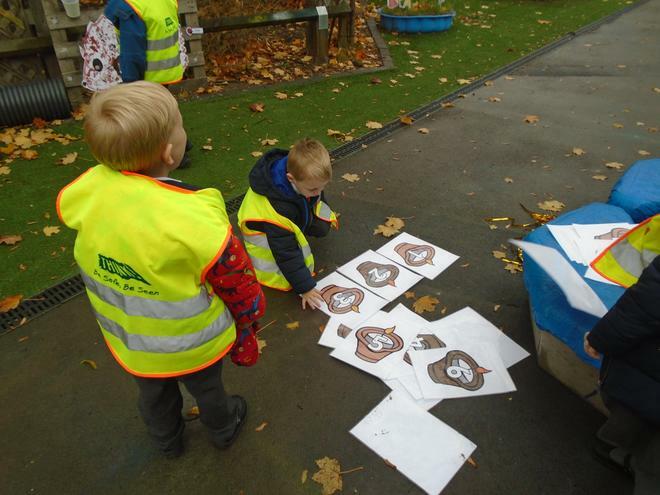 The children have begun a new topic which will help children explore the similarities and differences between themselves and their peers. 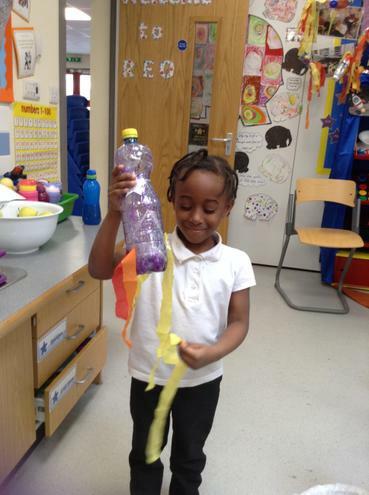 Look at the topic map below for ways in which you can support your child. 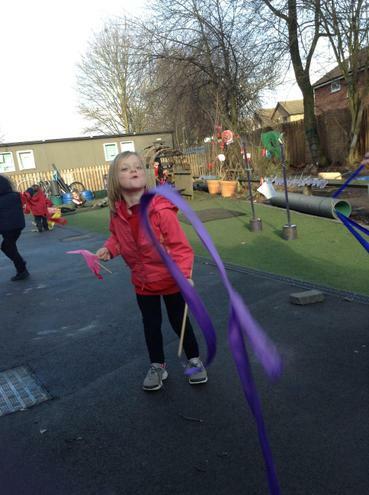 Look at some of the fun activities we have explored. 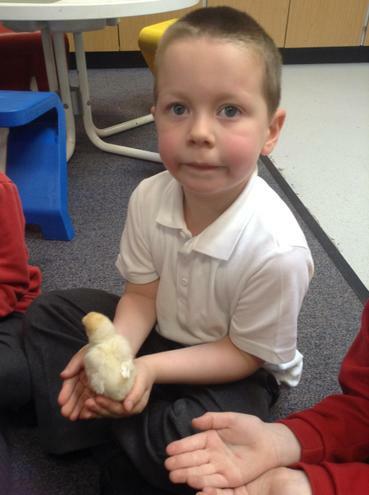 The children have spent the first few weeks making new friends and becoming familiar with the new adults in their classroom. 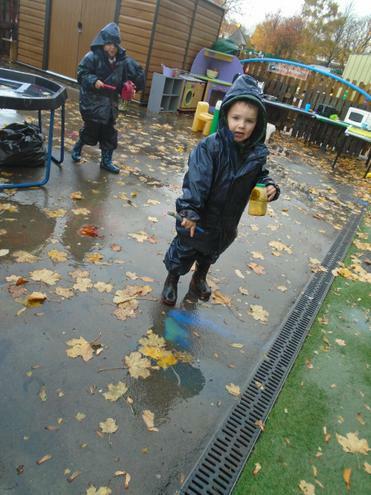 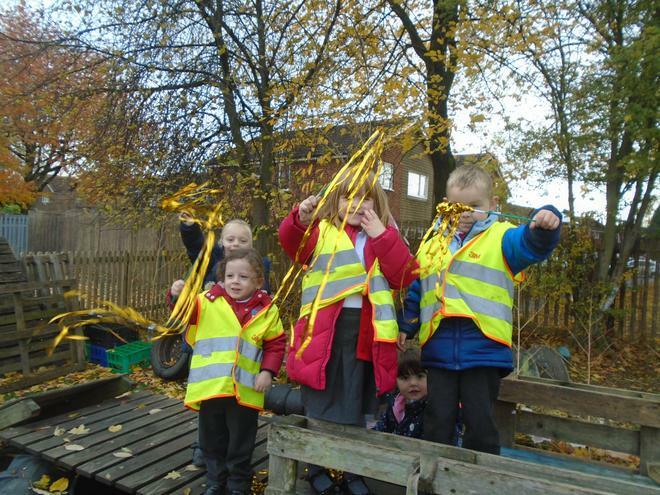 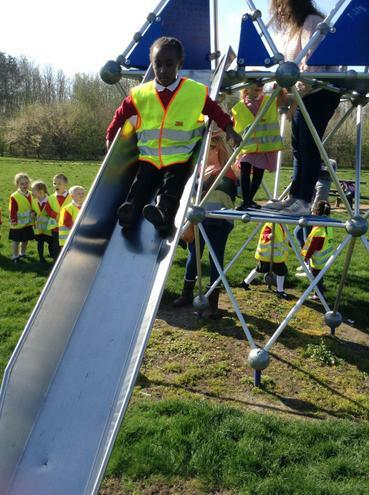 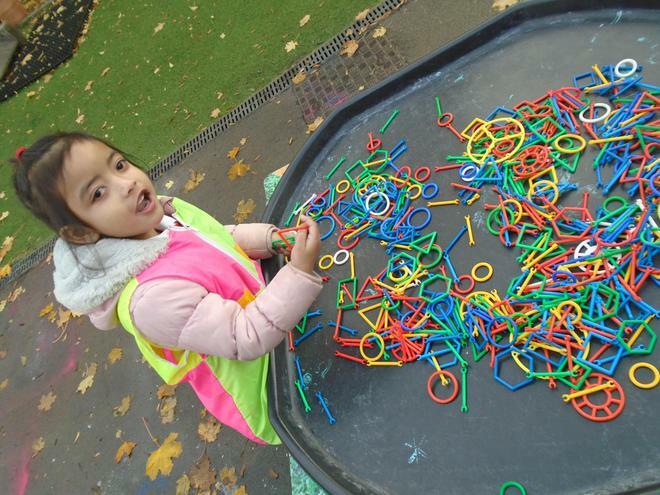 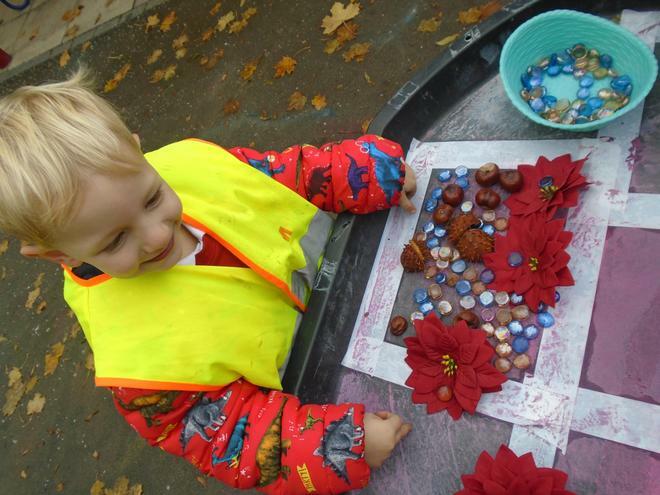 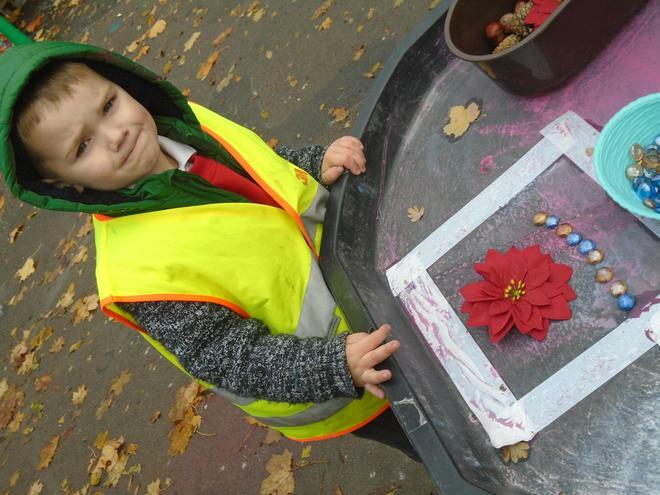 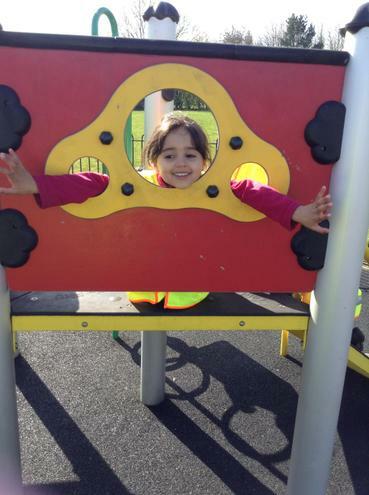 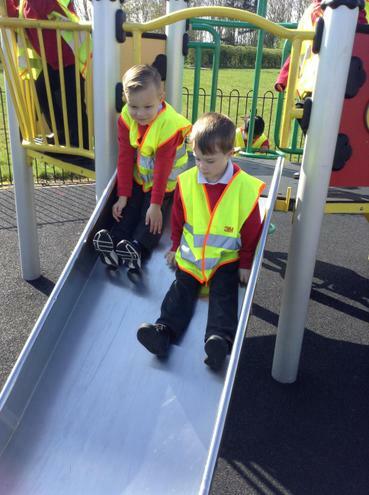 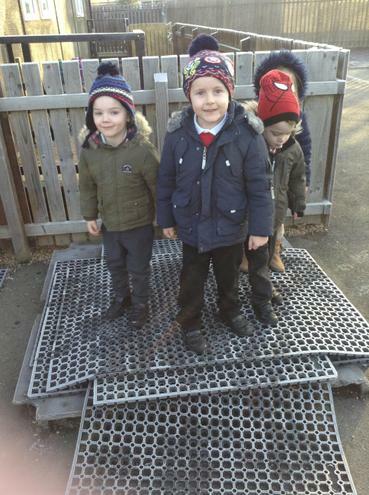 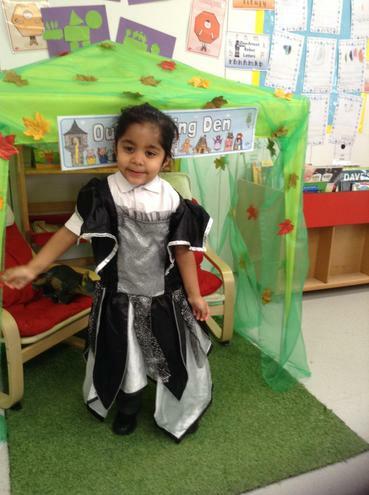 They have enjoyed a variety of activities both inside and outside that have allowed the children to explore their new surroundings. 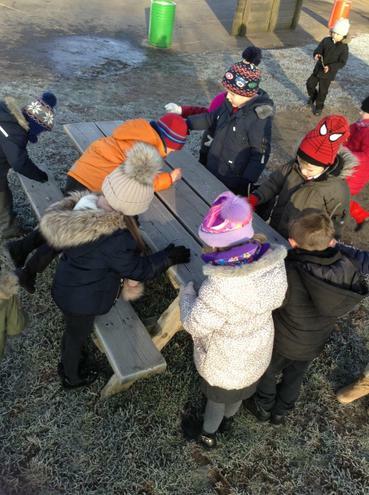 The children have enjoyed sharing their experiences of the sea-side and are keen to tell us lots about themselves and people who are important to them. 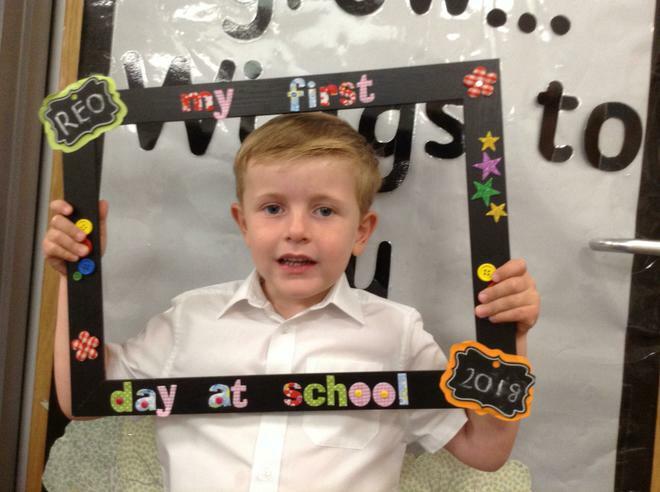 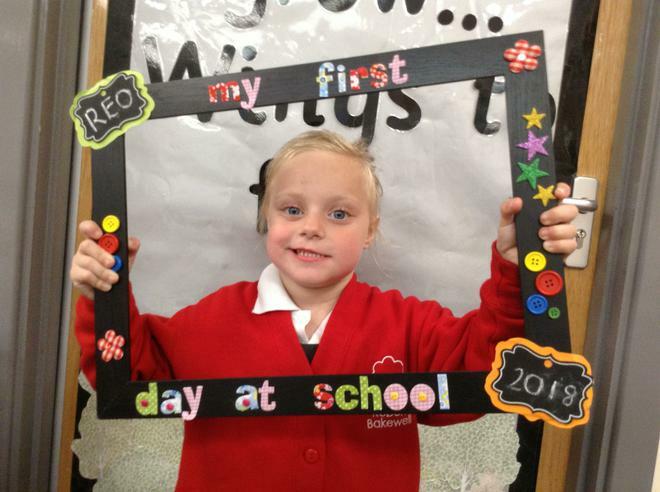 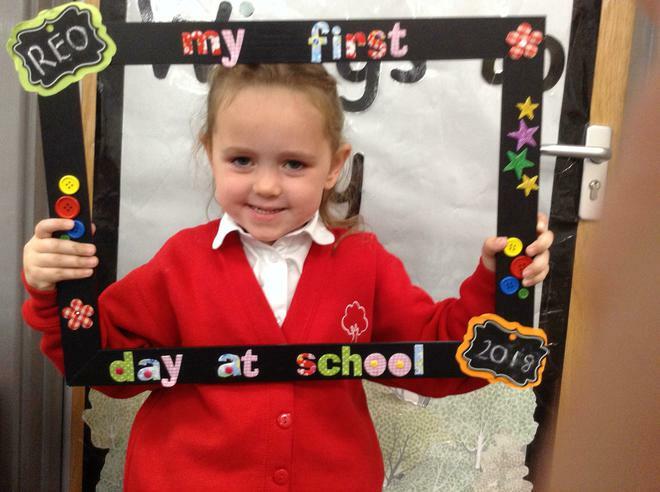 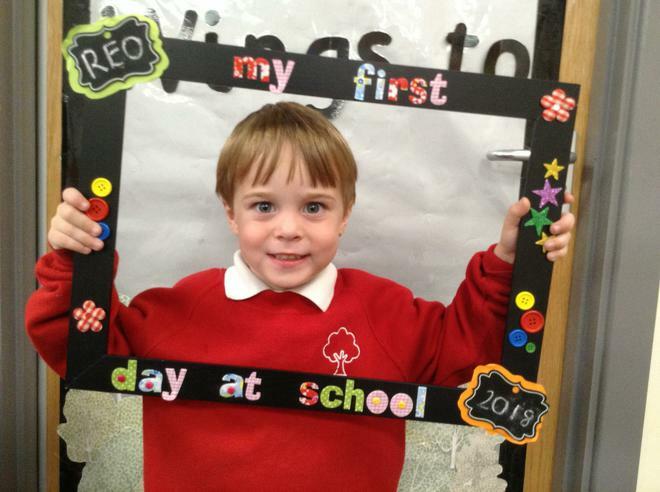 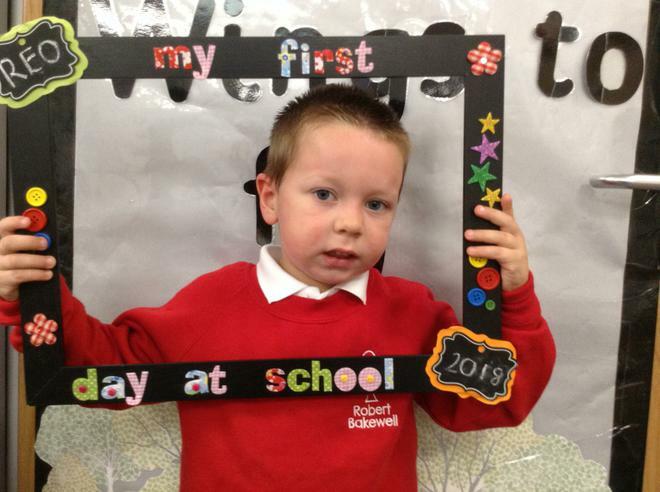 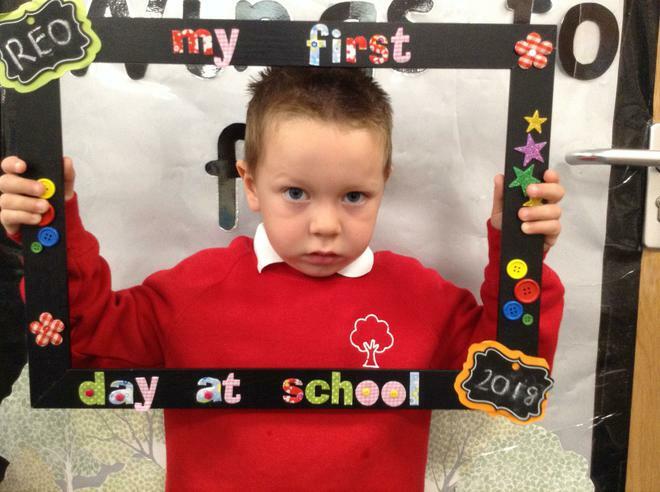 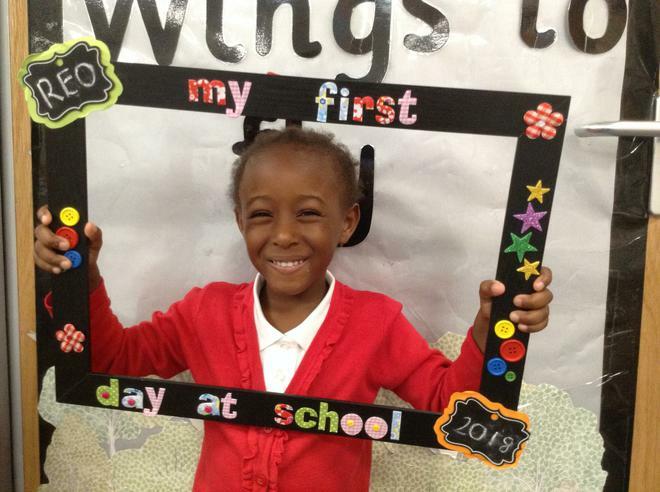 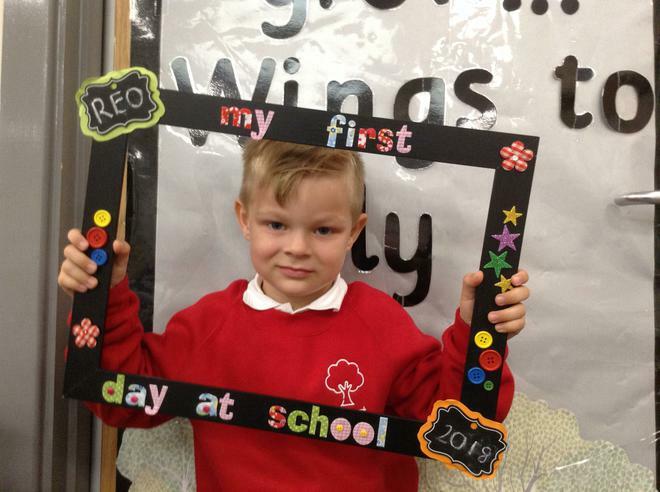 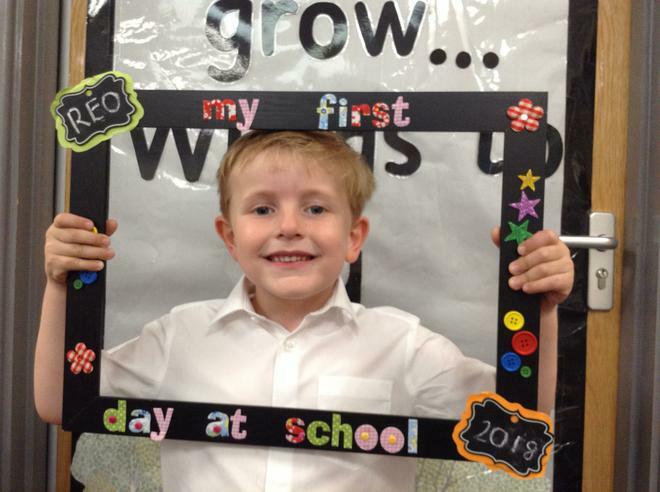 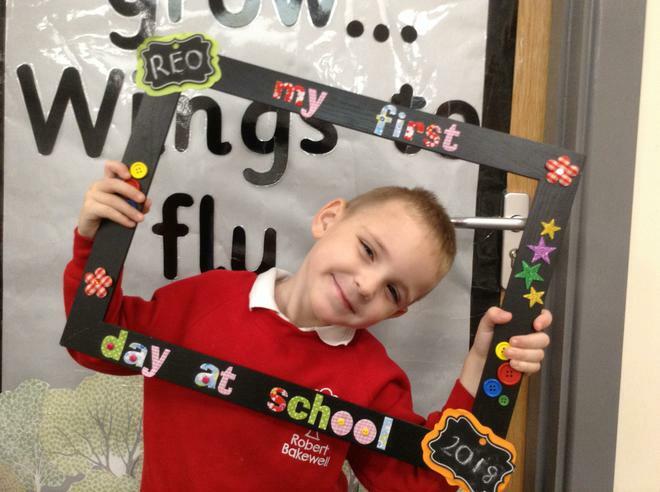 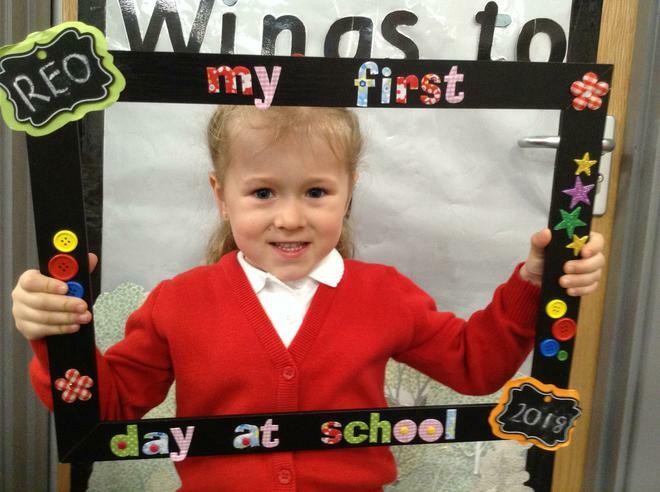 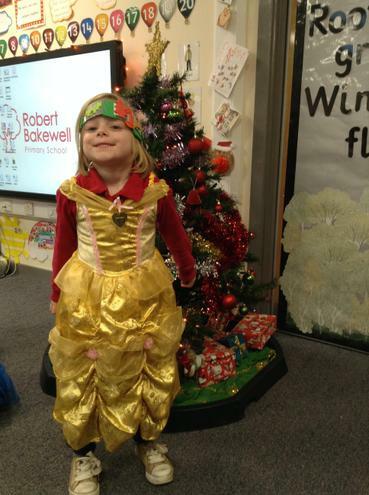 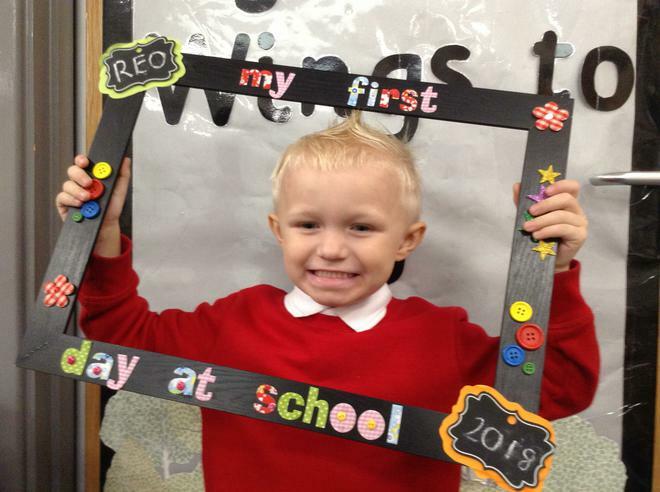 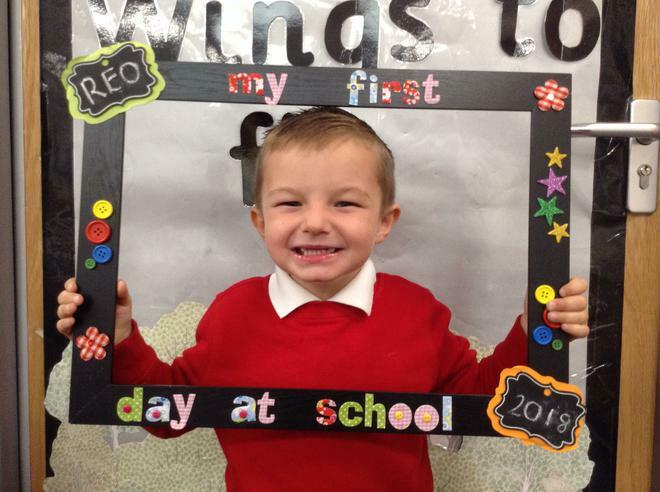 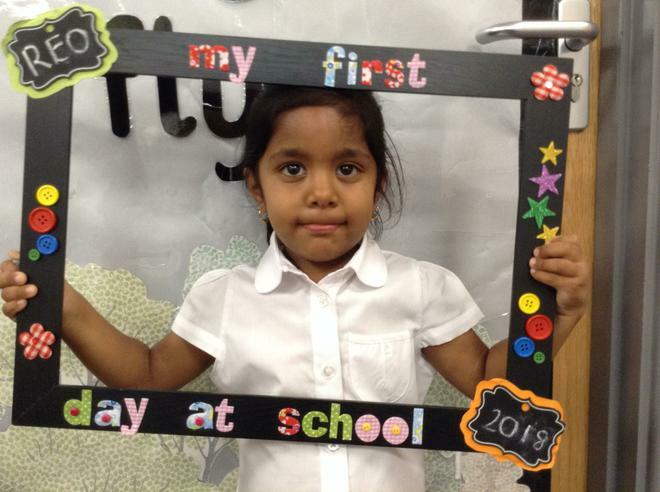 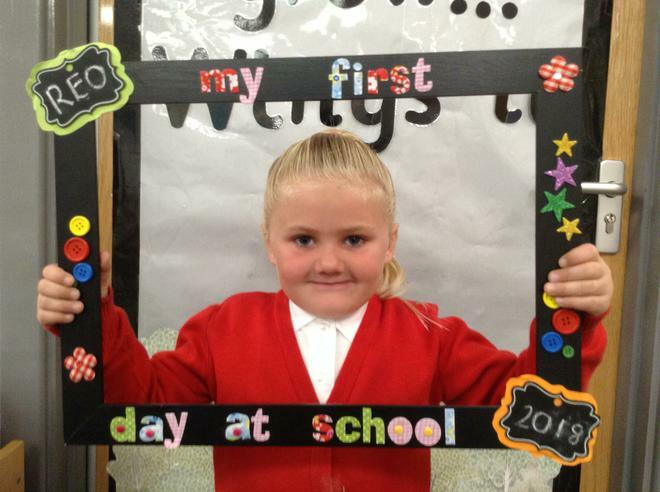 Welcome to your child's first year at Robert Bakewell. 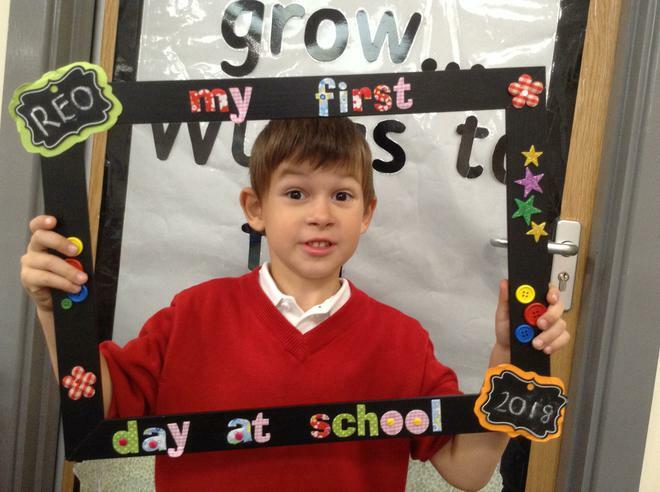 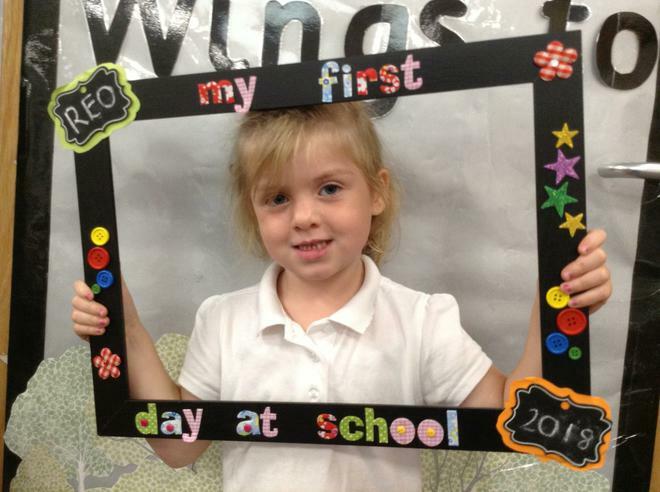 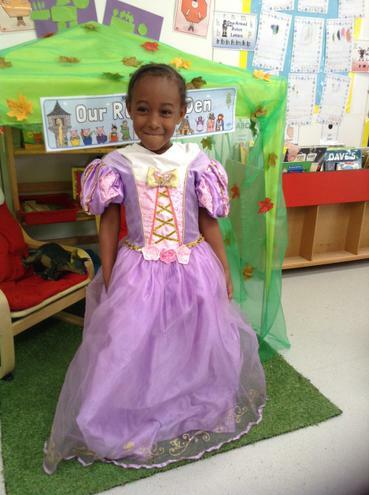 We cannot wait to begin the next chapter in your child's education. 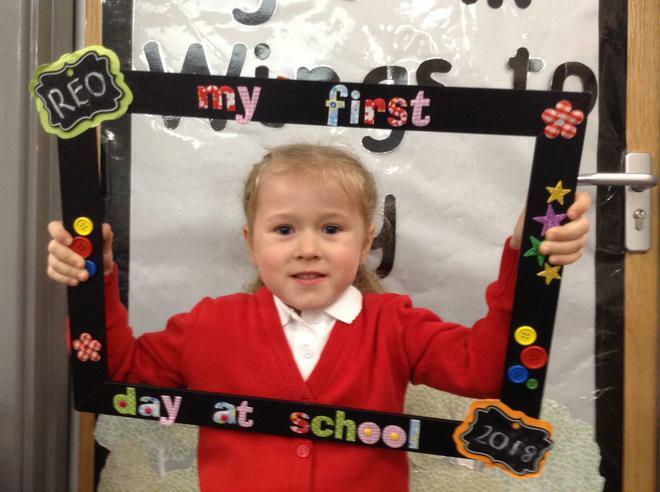 We are very impressed with how well the new intake has settled into school. 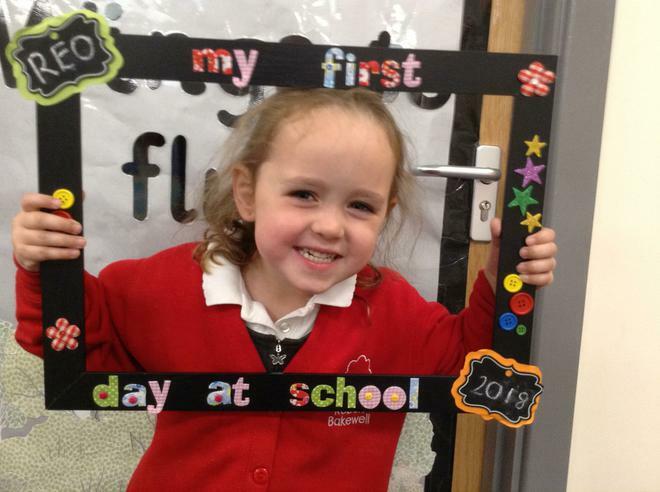 They are already showing great enthusiasm for learning as they bound through the door each morning with the happy smiles that greet us. 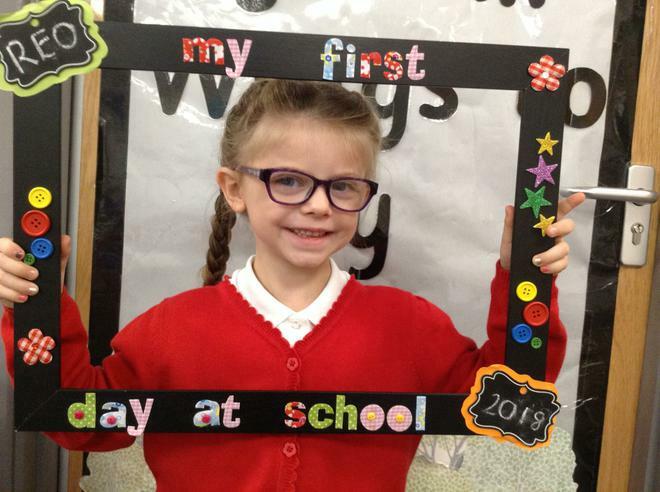 We look forward to sharing their journey with you through our web page so please ensure you have a look at it on a regular basis.